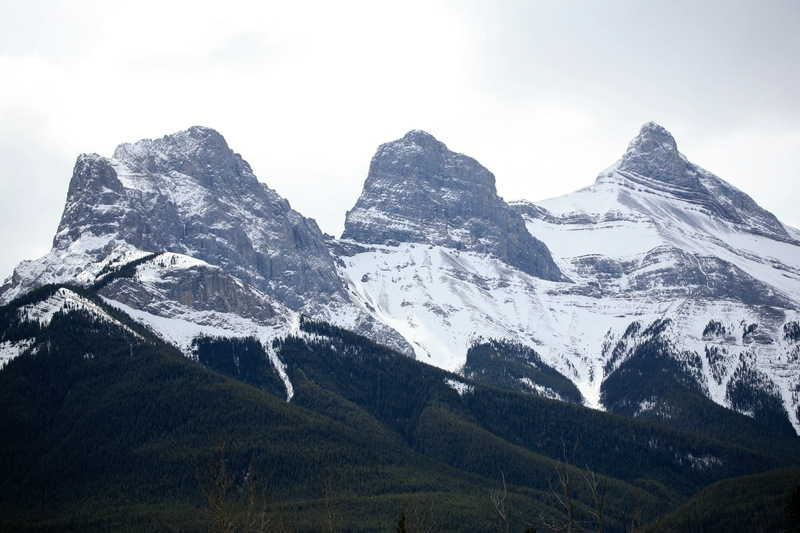 PhotoWestGuy « Digital photography from the foothills of the Rockies. 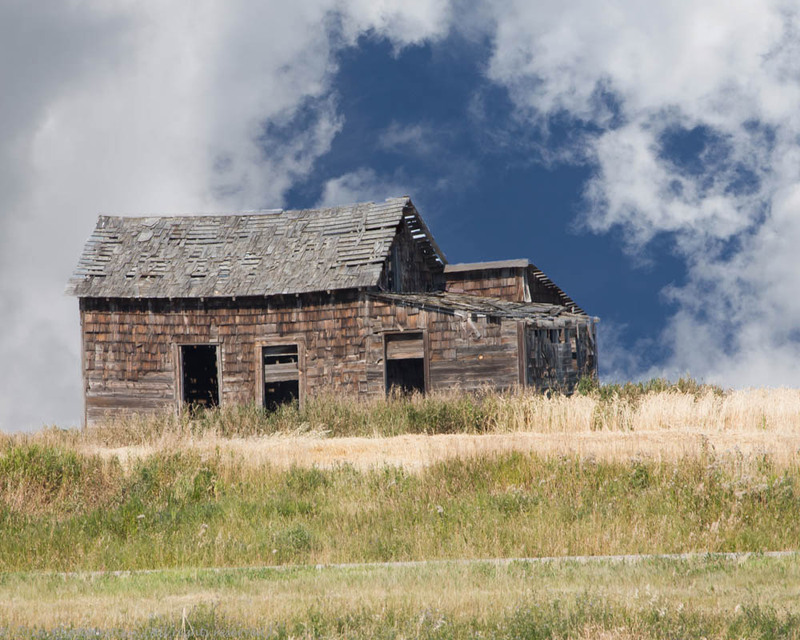 Digital photography from the foothills of the Rockies. This blog is a bit late in arriving for a few reasons: 1) I was up in Northern Canada for a few days photographing the Northern Lights, 2) I was in Arizona on a landscape photography workshop, and 3) I was having a mental block on what to write about. Then, it struck me – why not write about having mental blocks in your photography, just like I was having them with my writing and VOILA, this blog session was born. Have you ever just sat and stared at your camera and thought to yourself – What do I photograph now? – or some variation on those words. A lot of you may have heard of “writer’s block”, well, I am sure a lot of us go through a lot of the same kind of situation when it comes to our photography. OR, do you feel like you are stuck in a rut – a photographic rut, where you feel like all your images look alike and the old “spark” seems to be gone. Rest assured, you are not alone. So what do you do about it? Well, you can sit back, relax and hope that this whole “mental block” thing goes away and that you will be struck by a bolt of inspiration. This is probably not going to happen. When you get into this frame of mind, you have to actively do something to get those old creative juices running again. This is sort of a personal “brute force” exercise. No you don’t have to go out and beat up somebody, or get somebody to beat you up. You have to actively get up off your derriere, grab the camera and get out there. Regardless of what you do when you get “out there”, it is always nice to have some sort of a plan as to what you are going to photograph – the ”plan” gives you some order to what you are going to do, rather than wandering aimlessly around still wondering what you should photograph. Here are some suggestions for those of you looking to clear the old mental block hurdle. Practice your technical skills – get to know your camera intimately. Grab the manual, sit down and find learn three or four of the buttons that you hardly ever use and learn what they do. Set up a subject in a darkened room – doesn’t matter what it is, use the built in flash, or if you don’t have one, put a flash on your camera and practice taking pictures in the dark. This should help you get to know where all the important buttons are so that you are not constantly looking for them when you are out in the field photographing fast moving subjects. Practice shooting the same subject with different focal lengths or different lenses. Look at photos by other photographers. If landscapes are your thing, then go and look at images by Ansel Adams, any of the Caponigros or the Muenches, Galen Rowell, Art Wolfe, Alain Briot, Darwin Wiggett, to name a few. If flowers are one of your favourite subjects, then check out the work of Denis Ippolito, Harold Davis or Kathleen Clemons among others. I could go on, but you get the idea. Reviewing the work of others often provides ideas on what we like or not and why. You can read tutorials on the web. There are a lot of them out there. Pick a subject, Google it and you will probably find hundreds if not thousands of sites that have something to do with the subject in one way or another. You could start by reading something about the elements of composition – http://photoinf.com/ – is one place to start. There are many others and we can all use a refresher on composition in our photography. Try a new subject area. 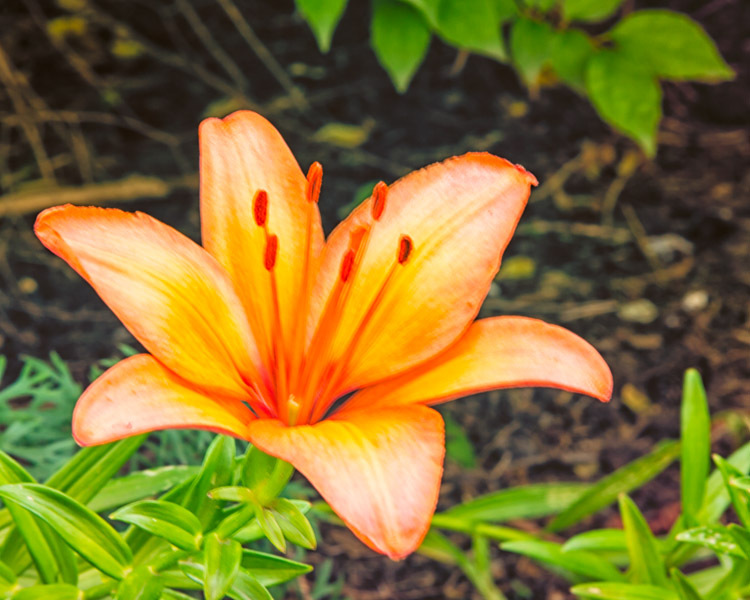 If your main area of interest is landscapes, then try photographing flowers, even if you have to go to the local store and buy an assorted bouquet. Got to a wrecking yard and photograph old cars or car parts, but be sure to get permission from the owners. Take a drive in the country (anywhere away from the city) and photograph domestic animals in the fields. Got to the zoo and photograph the animals. Be sure to check out their “rules and regulations” before doing so, just to ensure that you don’t get asked to stop or worse, leave the premises. Go for a walk. Take your camera with a single lens – fixed or zoom, it doesn’t really matter and go for a walk in a park, or just simply around the block, assuming you have a block to walk around. Stop every ten feet and take five pictures. It doesn’t have to be five, I just picked that out as a nice round number. It could be two – one to the right and one to the left – your choice. The objective here is take pictures. Now you have five suggestions as to what to do if you are suffering from photographer’s block. The real key is to do something – anything – to get you out of the rut you find yourself in. In the words of that famous Nike slogan – “Just do it”. Light, glorious light – the MOST Important thing? The word photography is derived from two Greek words and basically means drawing with light. Sir John Herschel is generally credited with coining the word and introducing it to the public in a lecture on the subject to the Royal Society in London in 1839. Details of the history of photography and its development can be found in a number of books. An online search using Google will render a multitude of references of the early days of photography. For those of you old enough to remember, film was probably the first medium of image capture that you used. While some photographers still use it today, the vast majority of image capture is through some form of digital photography. Regardless of how you capture images, light is still the most important aspect of that process. In a recent issue of Photo World, Wayne Lynch notes the importance of four aspects of light. After reading it, I decide that the word DISC is an easy acronym to remember these four aspects of light. D – direction. Where is the light coming from? I – intensity. How bright is the light? C – colour. What colour is the light? This is relatively simple to decide, either the light is coming from a particular direction, or it is not. The source often does not matter. Light can come from your right or left, over your shoulder, i.e., from behind you, or from your front. Each direction will cast different shadows. Perhaps, the one exception is daylight on overcast days. The light seems to come from everywhere, although subdued when compared with bright, sunny days. The light from overcast days is like being inside one giant soft box. Light coming towards you is usually required to make silhouettes. If the sun is behind you, then your subject will be fairly evenly lit. If the light comes from the side, then this may make the lighting in your image more interesting and often more dramatic. Depending on the direction, shadows will be to the right or left of your subject. When the sun is overhead, then there are very few shadows and image taken during these times can look very flat. 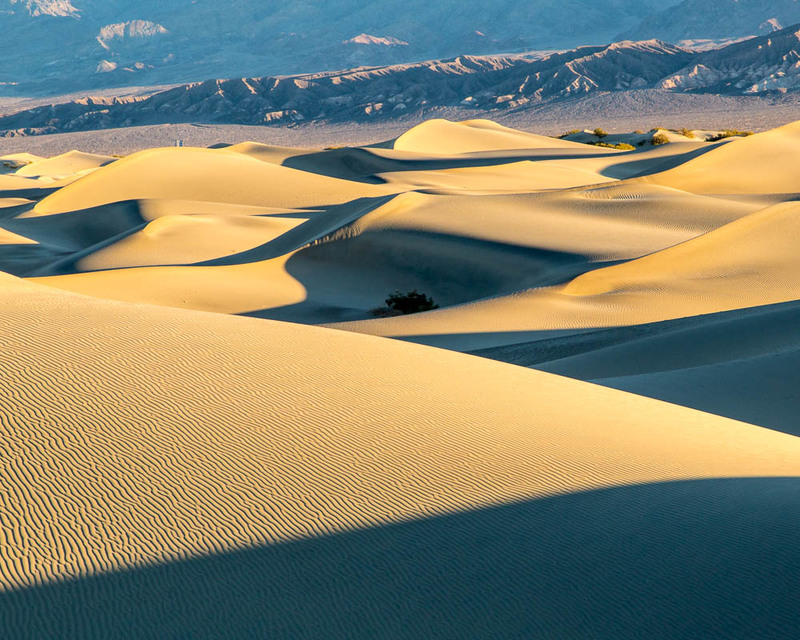 Death Valley – shadows created in dunes by early morning sunrise from the right. Without the shadows, the dunes would probably not be so obvious. Death Valley. 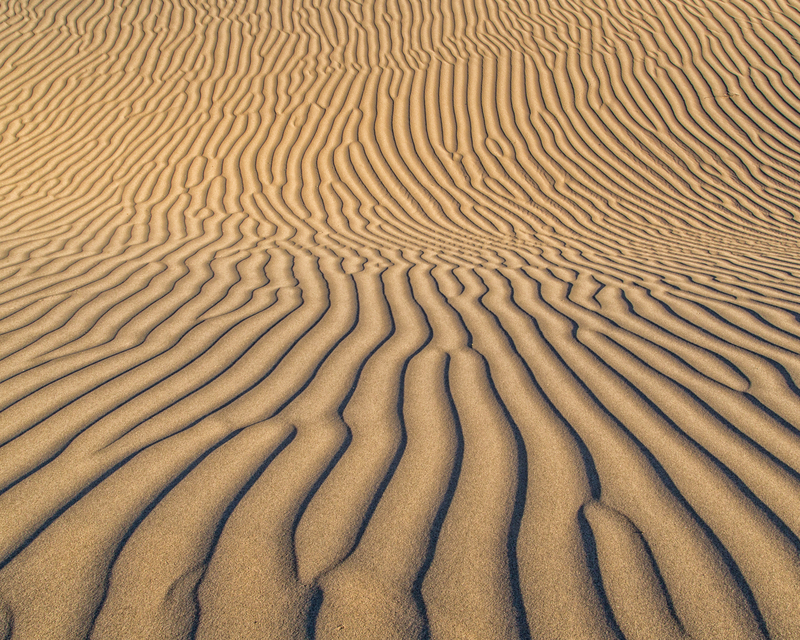 Ripples on dunes show well only in the early morning sunrise. Without the shadows, they would not have obvious depth. 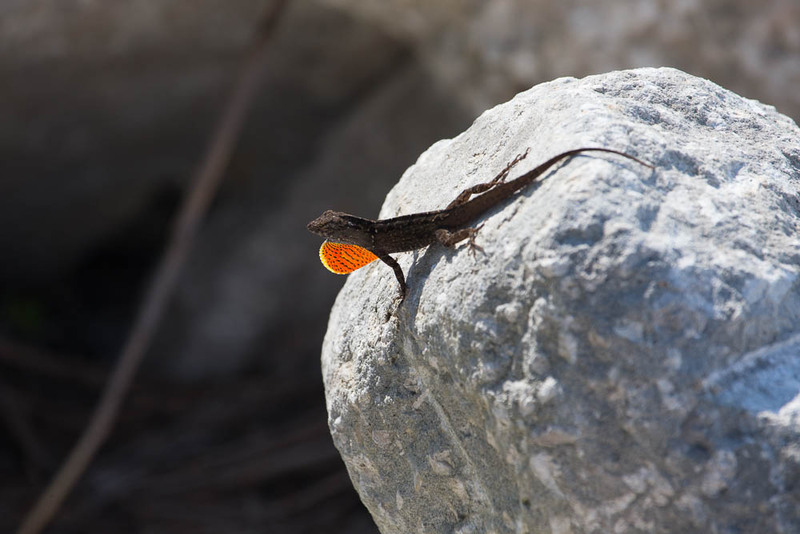 The sun was behind the lizard in this image. In any other position, his dewlap would not show as well as it does here. Intensity is a measure of how strong the light is. In the case of sunlight, for example, are you dealing with the warm light of sunrise and sunset that provides long, soft shadows, or are you shooting in the middle part of the day when the sun is overhead and the shadows are very strong and harsh. In the case of flash photography, shadows can also be soft or harsh depending on the intensity of the flash and whether or not accessories such as diffusers or reflectors are used. Such accessories can also be used to modify the effects of sunlight. Often, if you are shooting indoors, you may have to deal with artificial sources such as fluorescent or incandescent light. The factors of intensity are also valid here. One other source that is becoming more popular are LED lights. These are usually found in a set of LEDs that are available in camera stores and industrial supply warehouses. Some of these are simply ON/OFF with the colour of the light being constant and others allow the colour of the light to be adjusted over a variable range. In this image, the sky is overcast, so the intensity of the sunlight is relatively low. There are few shadows to reveal the detail in the rocks on the mountains. In this image, the mountain face was lit by sunlight behind me. The shadow is from a single cloud in the sky. 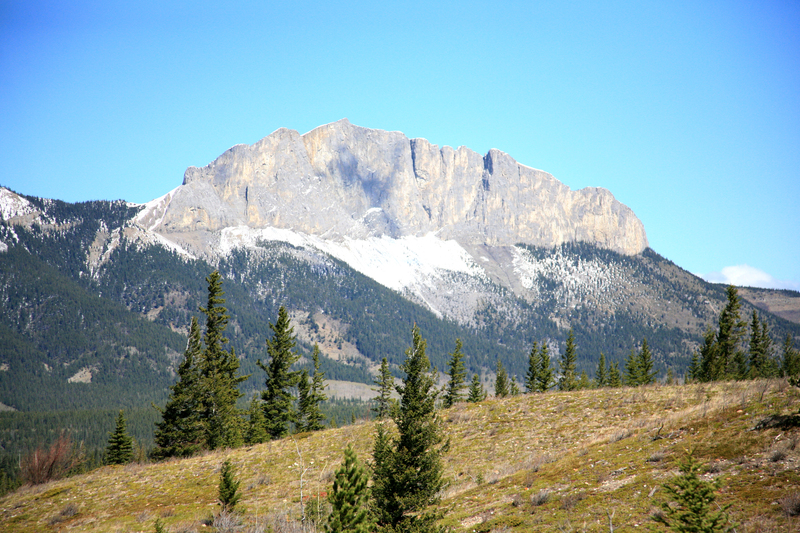 With this direct sunlight , some of the details in the mountain face can be seen . The source is pretty well self-explanatory. Are you working in sunlight, cloudy overcast sunlight, moonlight, flash, artificial or some combination? Generally, single sources are the easiest to deal with in terms of the exposure variables that are required. Mixed light sources may require some additional thought on the exposure variables to be used and on any White Balance considerations in post-processing. One of the most common scenarios with mixed light is when flash is used as a fill light in portrait photography. I also use this combination on occasion when shooting macros of flowers outdoors. Over the next few months, I will also be experimenting with the use of LED panels as fill light for outdoor flower photography. This is a high key flower image taken with flash. Two flashes were used, one was shot through a large diffuser from the left and the other was bounced off the image from the top. This image was shot in sunlight. The sun was on the left. This position provided for the well lit left side and the subtle shadow on the right. Light has colour. We may not always think of it as having colour, but it does. Perhaps the most obvious reference that most of us will have are the reds, oranges and pinks of sunrises and sunsets. For the technical readers, colour has a temperature, not one that you can measure with a thermometer, but a temperature nevertheless. The colour temperature of a light source has to do with the physics of what are called black-body radiators, but it has nothing to do with the human body. It, colour temperature, is a characteristic of visible light and is stated in the unit of absolute temperature, the Kelvin and has the symbol K.
Colour temperatures over 5,000°K are called cool colours while temperatures below about 2,700° to 3,000°K are called warm colours. The following table gives the approximate colour temperatures in degrees Kelvin for a variety of different light sources. These temperatures are generally characteristic of the medium, but some variation may be present. Knowing the colour of the light for your image is necessary to ensure a proper while balance setting. Even if you use Automatic White Balance, you may wish to make slight corrections to white balance in post-processing. To assist in any post-processing corrections, most photographers will make use of a grey card or an accessory such as the Colour Checker Passport®. 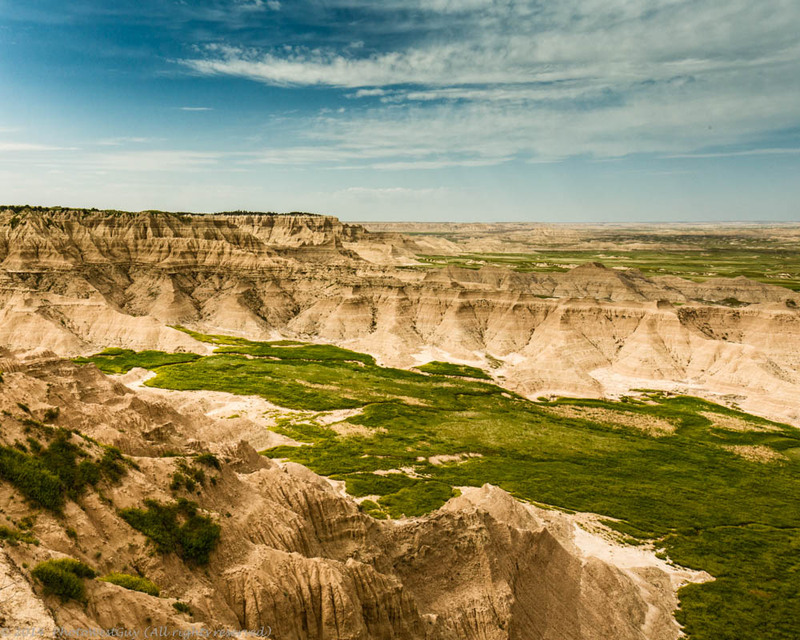 Badlands of South Dakota. This shot was taken just after a very red sunrise. The sunrise gave the reddish colour to the normally very drab, beige rocks. 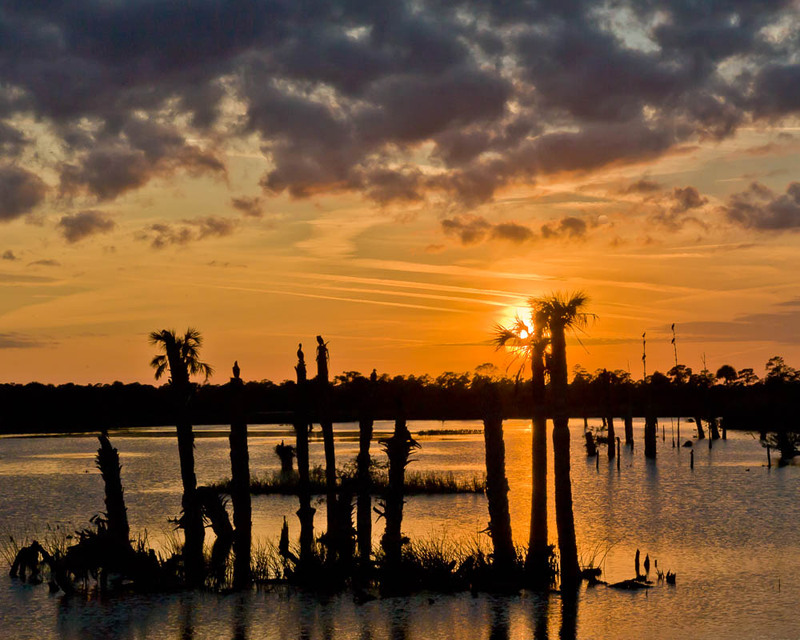 This image was taken in the Viera wetlands in Florida. It shows the orange-red colours of the sunset of the wetlands and the silhouettes produced by the snags in the water. The next time you set out to do some photography, make a conscious effort to assess the lighting conditions in your image. Use the acronym DISC to evaluate the light and adjust your exposure accordingly. As well, the determinations you make from your DISC evaluation may prompt you to change the time of day that you will take your photo. Maybe you should have gotten up at 4:00 am to take that photo! One subject that interests me is Clouds. Clouds are everywhere, or not. Good clouds can make a landscape image go from not bad to WOW and yet you can never photograph the same clouds twice. They are always moving, changing form, metamorphosing so to speak into new forms and varieties. The sky and the clouds that are in it are often the key elements in a landscape image, thus they often set the mood of the image itself. For me, there is nothing more boring in a landscape photo than to have sky with no clouds. No clouds equals no character and it is this character that contributes to the overall special nature of an image. 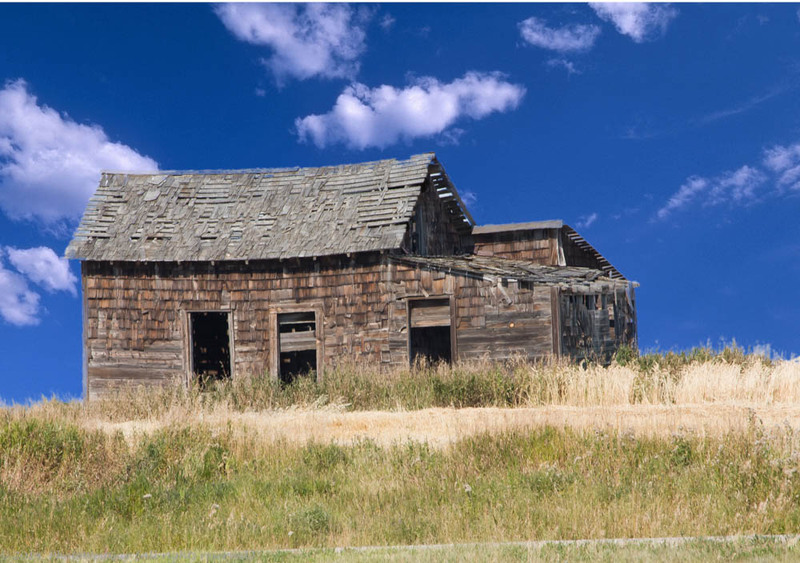 For example, consider the following three images, the first one is the original, taken on a bright, sunny, prairie summer day. As is often the case, there were absolutely no clouds in the sky. The following pictures have been augmented using onOne Software’s Perfect Layers and Perfect Mask software. They are not the epitome of sky replacements, but they do provide an idea of the difference that clouds can make in an image. The other aspect of cloud photography is the capture of storm clouds and maybe even the storm itself. The following images show two aspects of storm clouds. The first image taken in the afternoon shows almost the complete storm spread out across the prairies, in fact, in my opinion, the image is really about the storm and the rain falling from below the clouds. 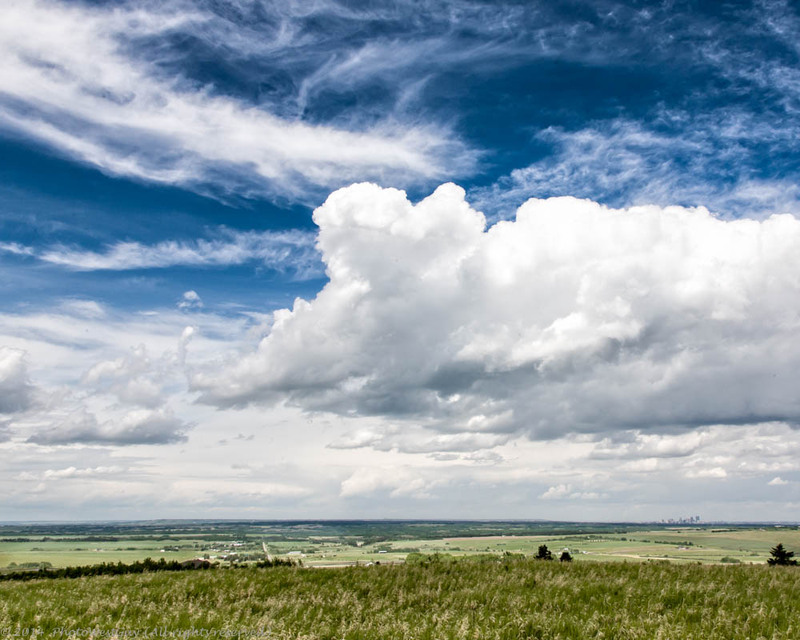 Without this element in the photograph, it would be just another prairie landscape. 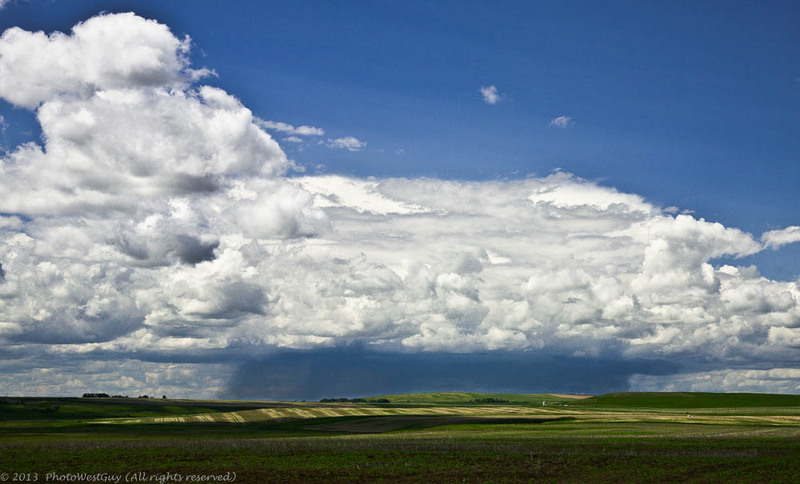 This next image shows a prairie storm developing above a field of canola (I don’t have any daffodils!). 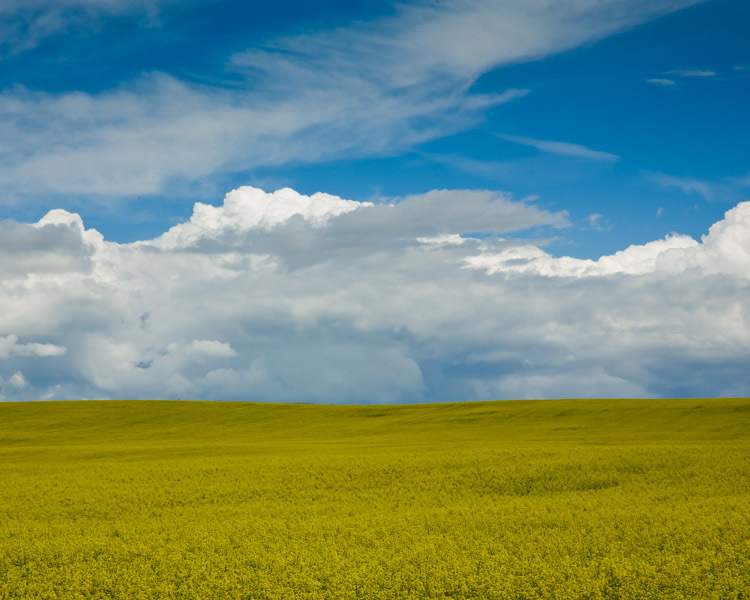 The yellow and green of the canola field provides an interesting contrast for the developing clouds against the blue sky. The image was also processed to reveal as much of the structure in the sky as possible without turning the image into a cartoon. Perhaps the prime condition for the use of clouds lies in the colours they can assume during sunrise and sunset. The following image was taken during a somewhat cloudy sunrise over the Masai Mara in Kenya. The colours speak for themselves. 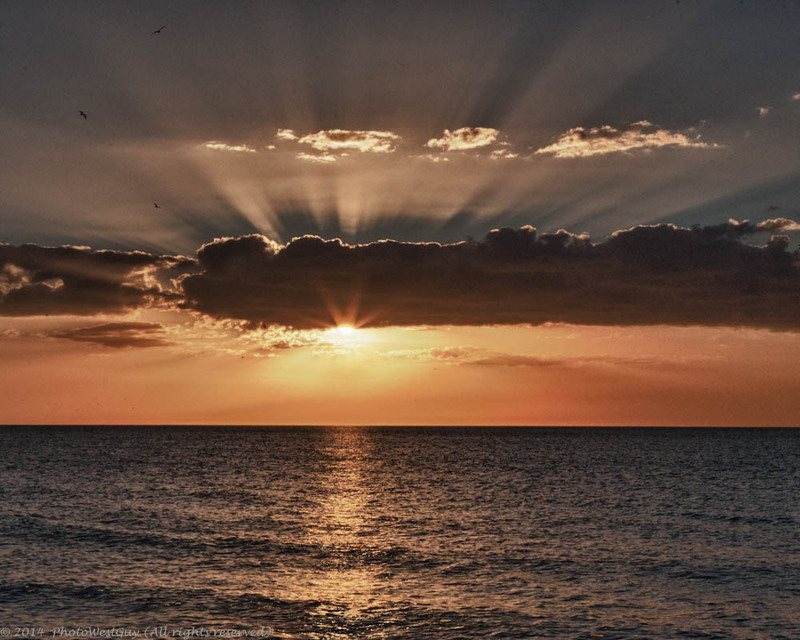 Compare this one with the following two images, the first of a sunset over the South Dakota Badlands and the second of a sunset over the Gulf of Mexico taken in Naples, Florida. 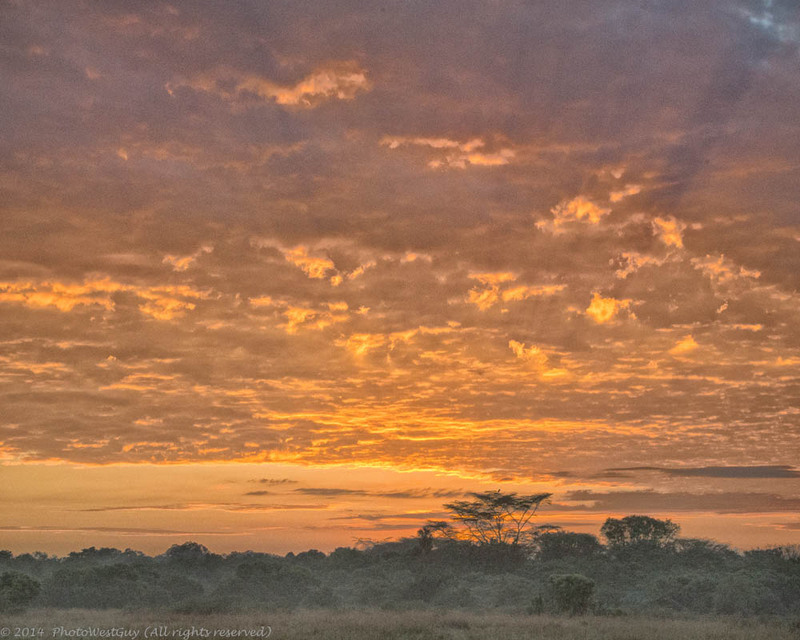 Sunrise over the Masai Mara. 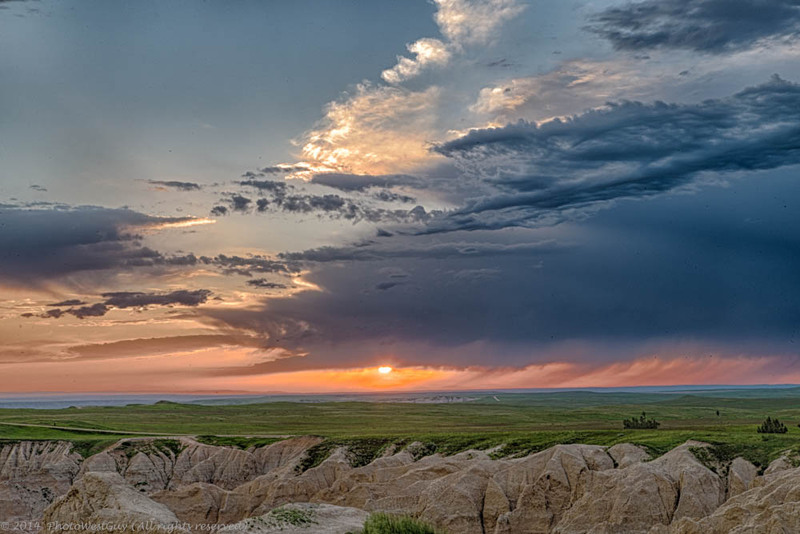 Sunset in the South Dakota Badlands. Sunset over the Gulf of Mexico from the beach in Naples, Florida. Each one is different, yet they share some similarity. If the clouds were not present, then the resulting sunset image would probably be very boring and ordinary, and probably not even worthy of any photographic effort. The colours that show up in the clouds provide the character for the landscape image. One other aspect of cloud photography is not concerned so much with the colours, but with the structure and details that one can find in them. You have everything from wispy cirrus to puffy cumulus clouds, each of which has their own particular appearance and structure. For those of you who are into the outdoors, knowing something about clouds in general and each type in particular will also give you some clues as to the type of weather to expect. Clear skies tell of high pressure and fair weather, whereas towering cumulus often foretell of stormy weather to come. High cirrus and lower fair weather cumulus that often form across the foothills and prairies during the day. They are both fair weather clouds, although the cirrus often are followed by rainy weather over the next few days. 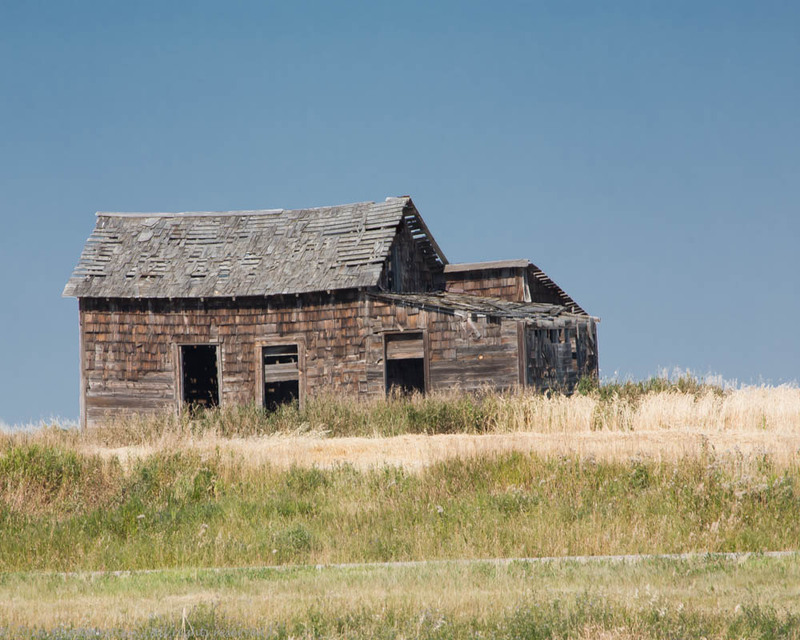 This image is from the Alberta prairies and foothills. They are cirrus clouds in the near sky with what appears to be cirrostratus in the distance. 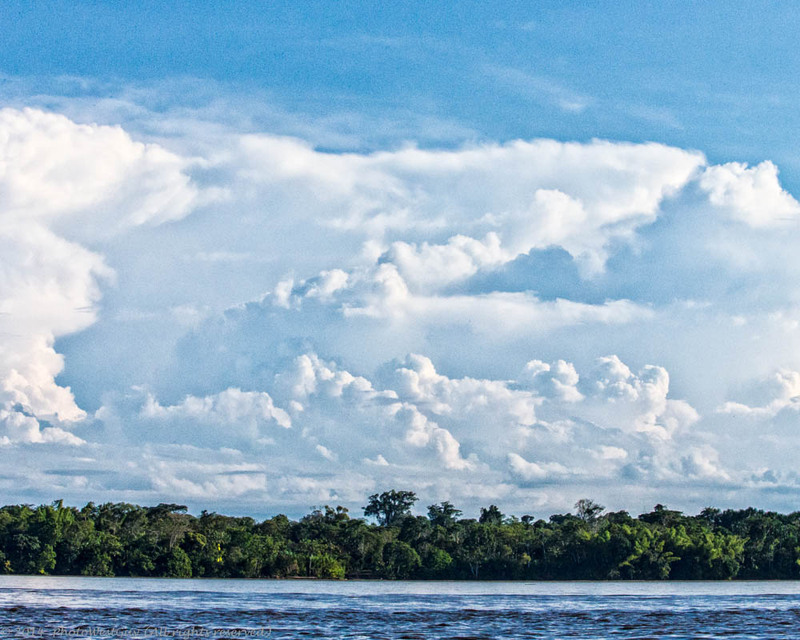 This image was captured over the Napo River in Ecuador. They are towering cumulus building towards cumulonimbus. We often saw these form during the day and the day often ended with a 1 to 2 hour thunderstorm and rain in the later part of the afternoon or early evening. These are Mammatus clouds, the drooping underside of a cumulonimbus cloud that often form under the anvil of a severe thunderstorm. They can accompany non-severe storms as well. 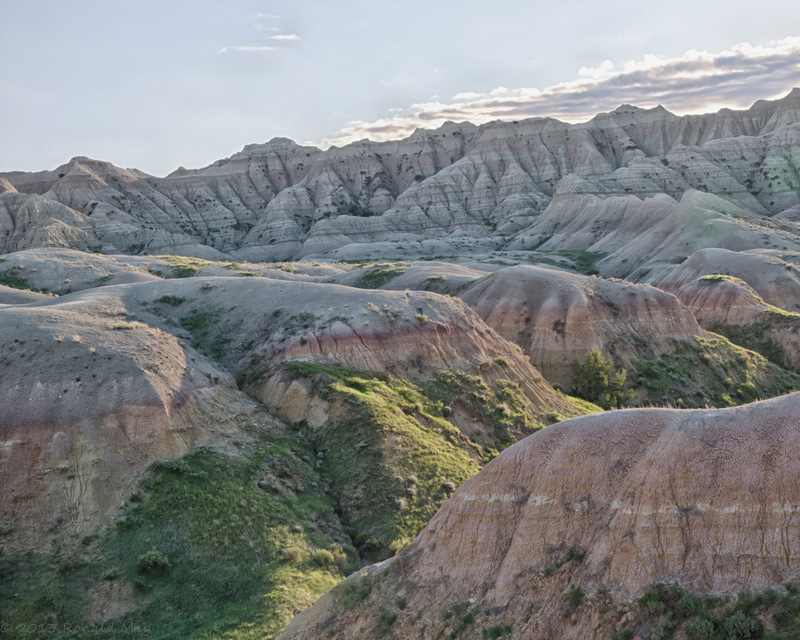 This image was taken in the Badlands of South Dakota. Within an hour, we experienced a fairly severe thunderstorm. 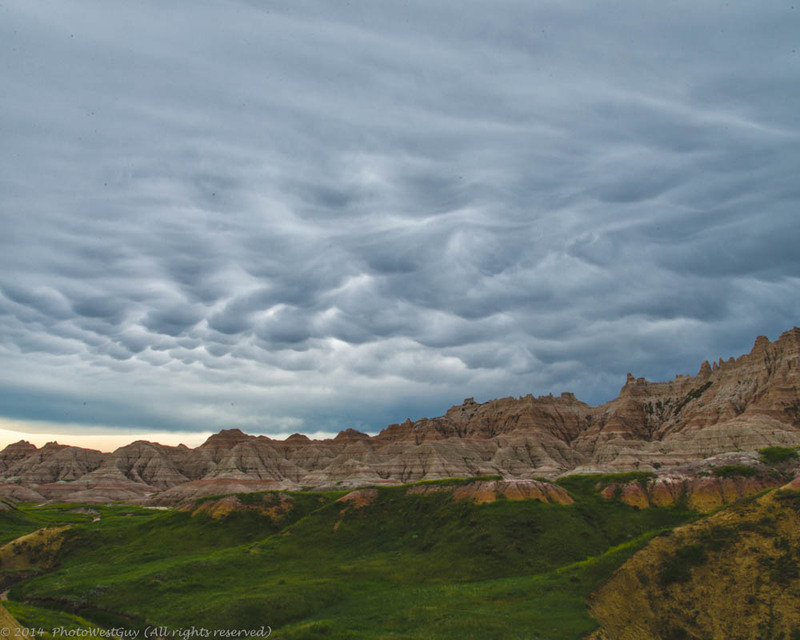 These are just a few of the various types of clouds that you can encounter in various landscape situations. They provide interesting images in themselves and, in my opinion, are always good to complement a landscape image. They provide another element of composition for the image and I would urge you to take advantage of what is above you in every landscape scenario. •	Clouds with character can be the major focus in a landscape image. If this is the case, then place the horizon along the lower thirds line in the image. Make sure that there is nothing obscuring the sky or that there are things like trees sticking up into it. 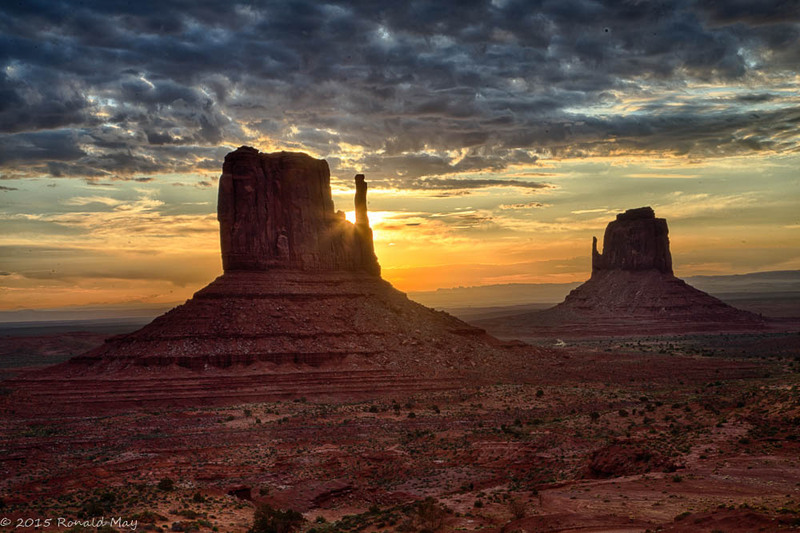 •	If you do not have ND Grads, then HDR imagery may be a way to capture the sunrise or sunset and provide you with detail in the foreground as well as the clouds. •	Try underexposing a bit as the sky is often very bright during the day. •	Try different things – for example, long exposures with a Neutral Density (ND) filter to give you blurs. 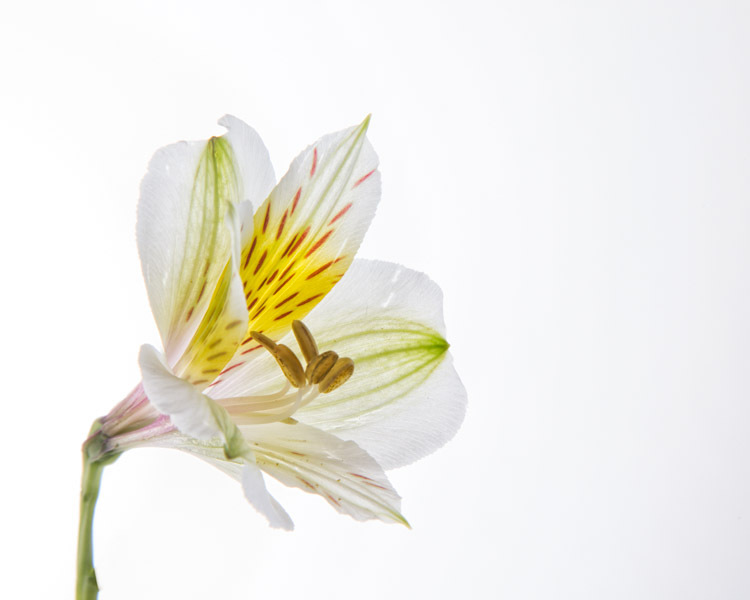 •	You can always save cloud pictures for use as backgrounds in other images, either by inserting them during processing, or printing cloud images on large sheets of photo paper and using them as physical backgrounds in close-up images of flowers. •	Use a polarizer to darken the sky, but be careful if you are shooting with a wide angle lens as the polarizer will not produce uniform results across the entire sky. •	Take lots of images. Clouds are constantly changing and memory is cheap. 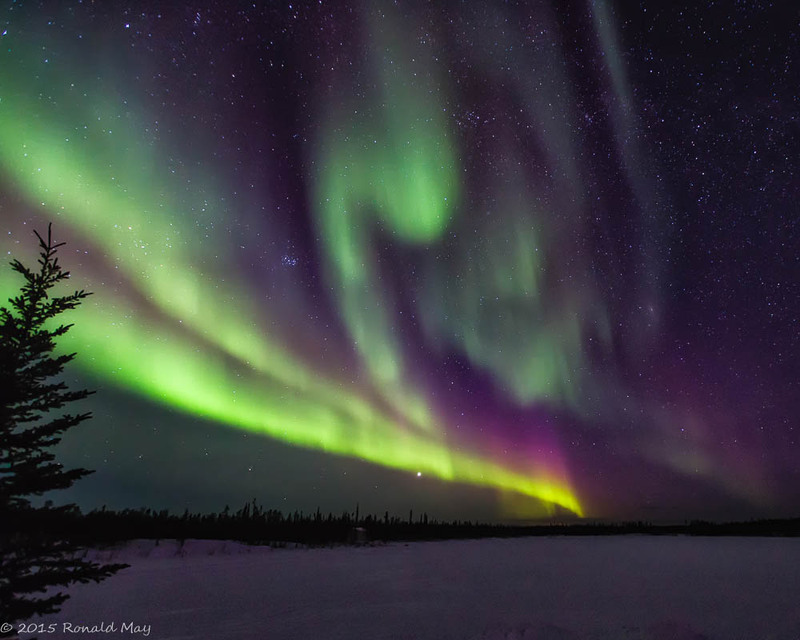 The next time you are photographing landscapes, remember to look up and see what is in the sky above you. More often than not, there will be clouds of one type or another that will add to the landscape. Their use is only limited by your imagination. I thought I would use this issue to share with you a recent trip I had to photograph the Badlands of southwestern South Dakota. For someone (me) who is interested in landscape photography, this area is a magnet that has drawn me to it twice now. I first went there in 2013 to attend a photo tour put on by Jason O’Dell (http://www.luminescentphoto.com) and Deborah Sandidge (http://www.deborahsandidge.com/). The tour lasted 3 days and I took an extra day to drive over to Wyoming to photograph the Devil’s Watch Tower. It is an understatement to say that I was literally blown away by the size and magnitude of the place. 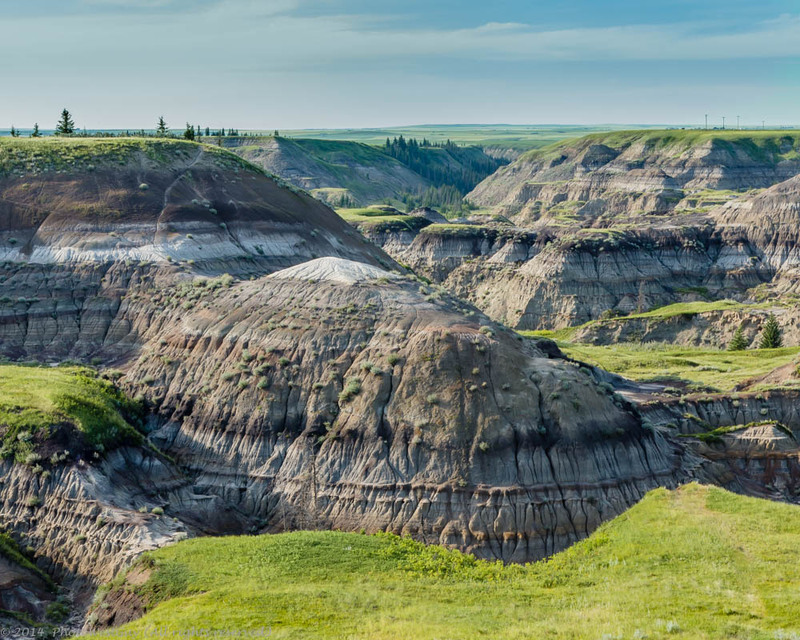 Coming from Western Canada, I was very familiar with the Badlands of Alberta that occur along the Red Deer River valley They pale by comparison to those of South Dakota. 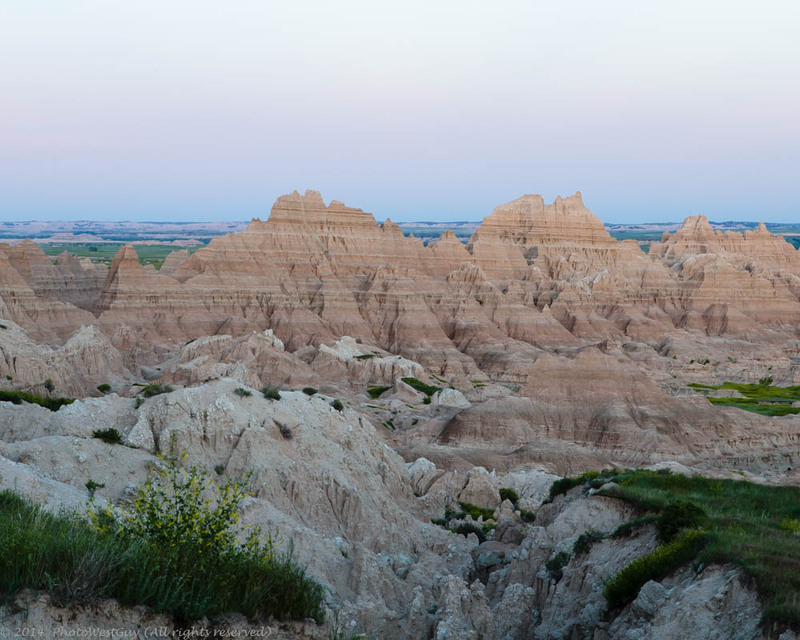 This year, 2014, I returned to South Dakota to attend the same tour, which was extended by a day and I took an extra day to investigate the southern portion of the Badlands for comparison. In my opinion, they are just as spectacular as the ones in the northern part of the park. 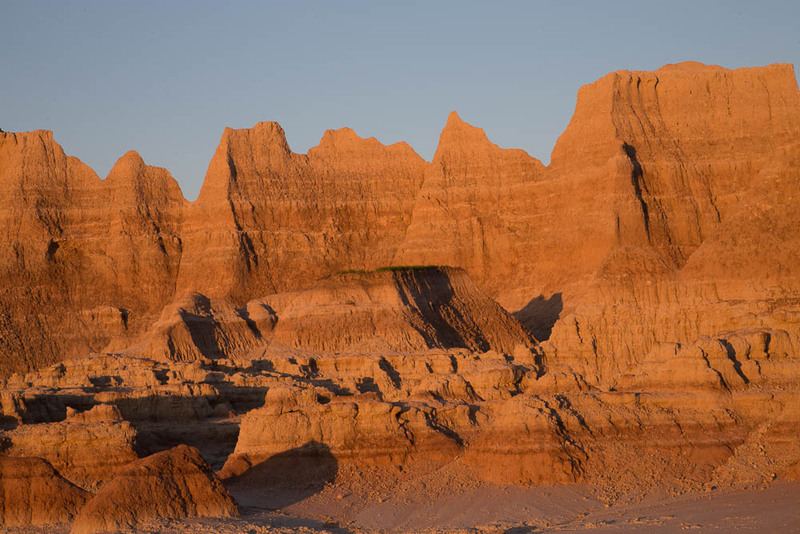 Badlands are loosely defined as a type of arid terrain where layers of the softer sedimentary rocks, sandstones, soft shales and often volcanic ash deposits, etc., have been intensely eroded by wind and water. The areas usually have steep slopes, very little vegetation and little if any soils covering them. They owe their appearance to the fact that the rocks are often poorly consolidated; this is a geological term that describes how well cemented, or fused together, the grains in the rock are and thus how hard the rock is. This poor consolidation makes the rocks easily eroded by wind and the torrential rains that often accompany summer storms. While some of the best known Badlands can be found in Canada and the United States, areas of similar landforms are known from New Zealand, the Putangirua Pinnacles; Italy, Spain, Argentina and Taiwan. I would encourage anyone who is interested to search the web for descriptions of these places. For now, I will limit my discussion to the two areas that I know best – Alberta and South Dakota. The Alberta Badlands http://albertatravel.org/Badlands_Alberta.htm occur at two major places along the Red Deer River. The first is in and around the City of Drumheller, named after one of the early settlers in the area. 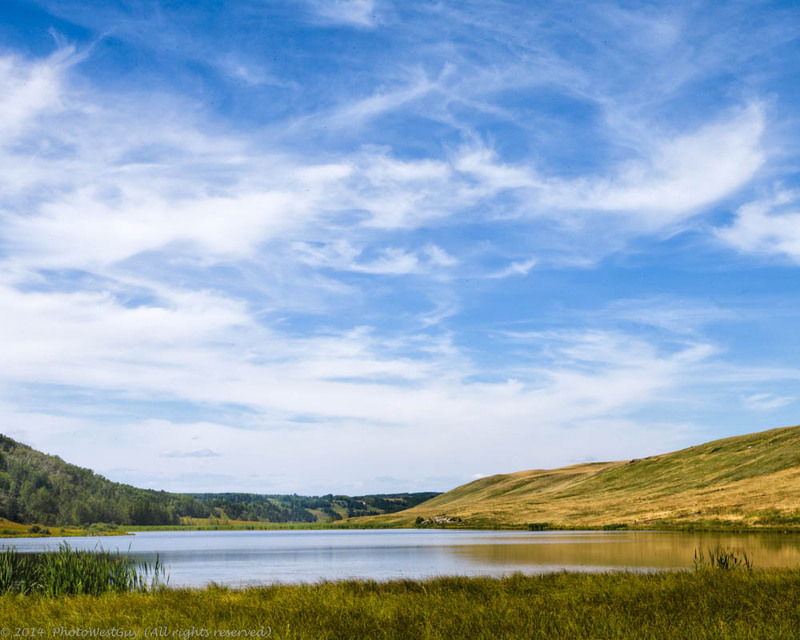 They also occur further down river north of the town of Brooks in an area that has been set aside by the Provincial Government as Dinosaur Provincial Park http://www.albertaparks.ca/dinosaur.aspx. Other areas of similar erosion can be found at places along the Red Deer River, however, they have not been granted Park status and are thus mostly on private land. Drumheller is about a 1.5 hour drive east of Calgary and Dinosaur Provincial Park, an established UNESCO World Heritage Site http://en.wikipedia.org/wiki/Dinosaur_Provincial_Park, is about another hour or so beyond that. In total, they are comprised of a number of different areas along the river totaling somewhere between 20,000 and 25,000 acres, roughly 8,000 to 10,000 hectares. The rocks in the Alberta Badlands are Cretaceous in age having been deposited in an interior sea between 60 and 80 million years ago.. They consist of sandstones, shales, siltstones and coal beds. In fact, coal was the major reason that this area was settled. The mines provided coal to heat homes in the area and to provide fuel for the steam trains of that time. These rocks have also been a great source of dinosaur fossils over the past few decades. 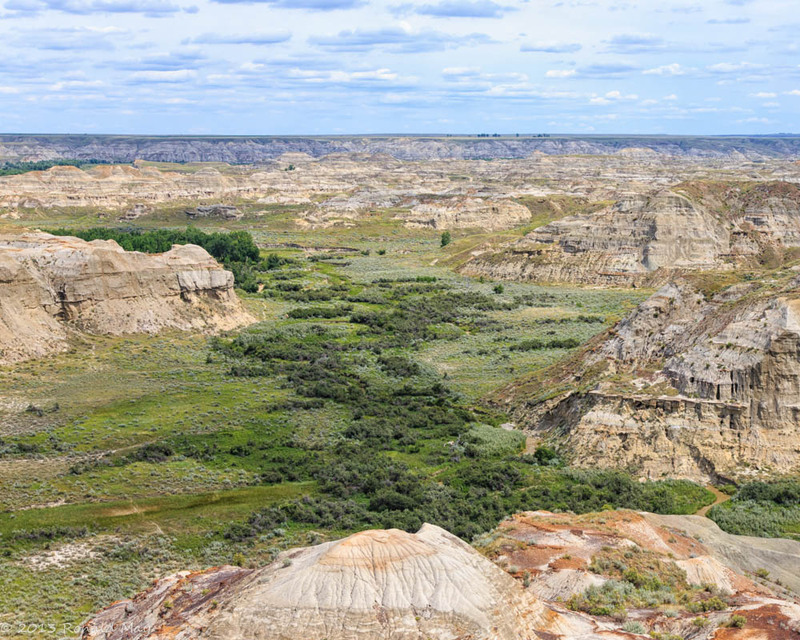 Alberta Badlands – Dinosaur Provincial Park – view from overlook at the entrance. Alberta Badlands at Horseshoe Canyon, south of Drumheller. Dark layers are coal and black shale, lighter layers are sandstones, siltstones and grey shale. 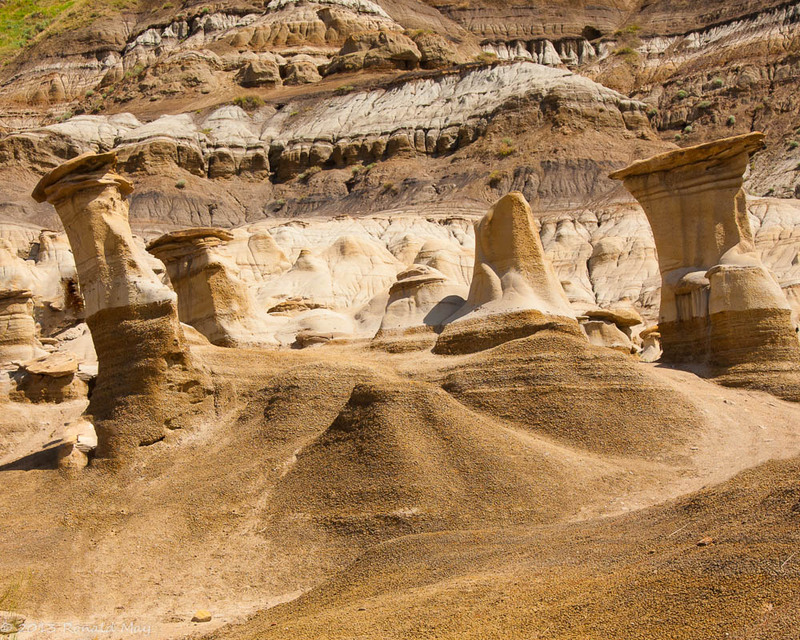 A feature of some badlands are these “tower-like” formations called hoodoos. They form with a cap rock or resistant sandstone and an underlying layer of softer shale or siltstone. The ones in this picture are about 3 to 5 metres high. Hoodoos in the making. 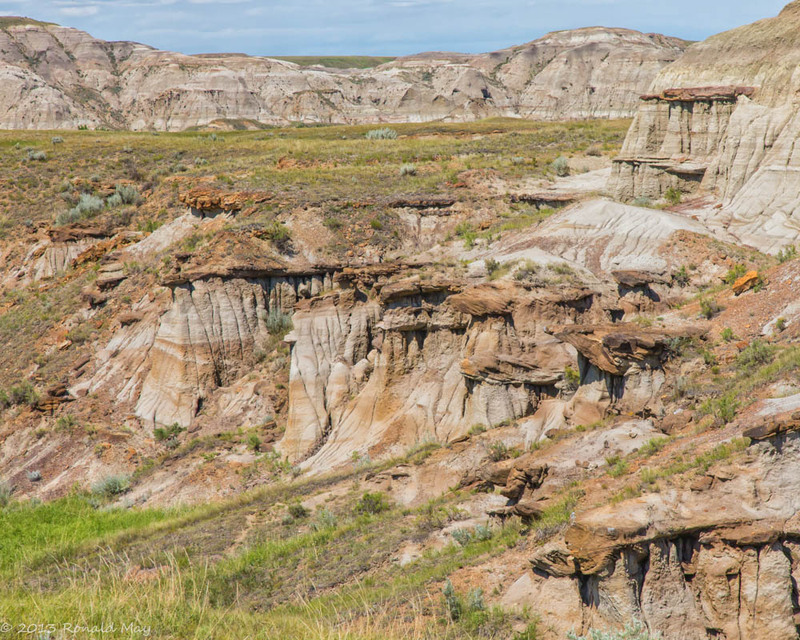 This image is from Dinosaur Provincial Park. 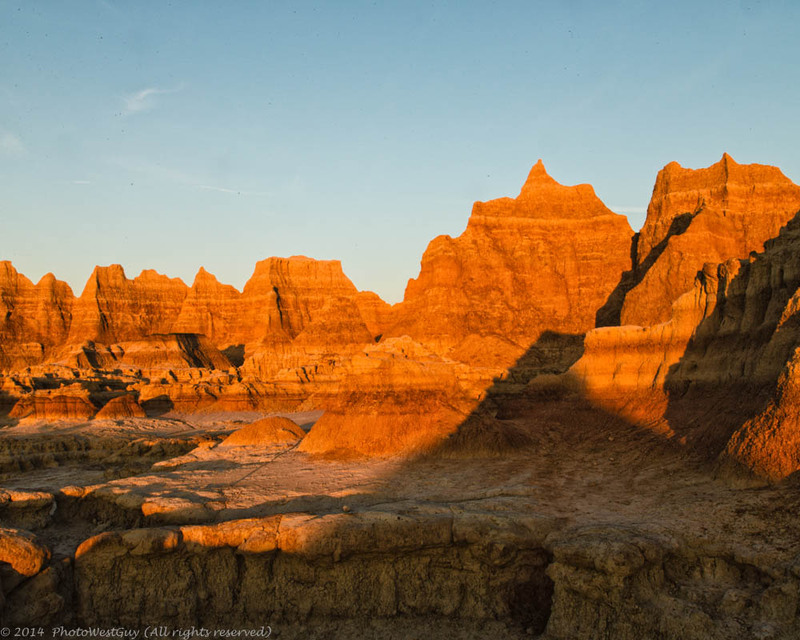 The Badlands of South Dakota http://www.nps.gov/badl/index.htm are made up of three units totaling over 240,000 acres (about 100,000 hectares). The North Unit, probably the best known, is that part seen by most tourists. It covers about 64,000 acres (about 26,000 ha) and contains the visitor centre, a seasonal lodge with cabin accommodation and a campground. The Stronghold and the Palmer Creek units are contained within the Pine Ridge Indian Reservation and are managed cooperatively between the Oglala Lakota and the US National Park Service. There is a series of roads that skirt the Stronghold Unit and give access to a lookout at Sheep Mountain Table and Red Shirt Table. The rocks, or sediments of the Badlands are underlain by the Pierre Shale of Cretaceous age, roughly 70 million years old. 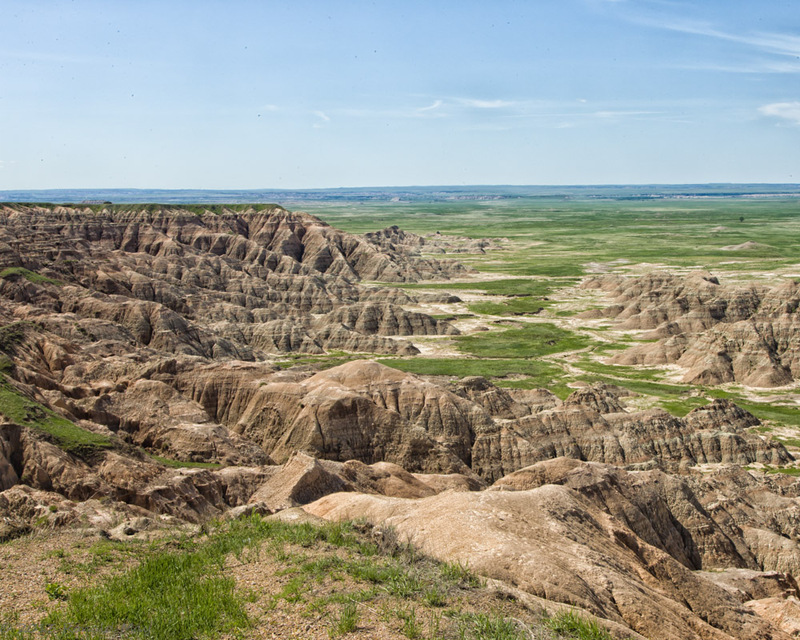 The sediments that comprise most of the landforms in the Badlands are made up of sandstones, siltstones and shales deposited in a variety of environments from shallow tropical seas to open woodlands with meandering rivers. This deposition took place in the Eocene 34 to 37 million years ago and the Oligocene (26 to 34 million years ago. Details of the geology can be found on a number of web sites, for example, http://www.nature.nps.gov/geology/paleontology/pub/fossil_conference_6/benton.htm . 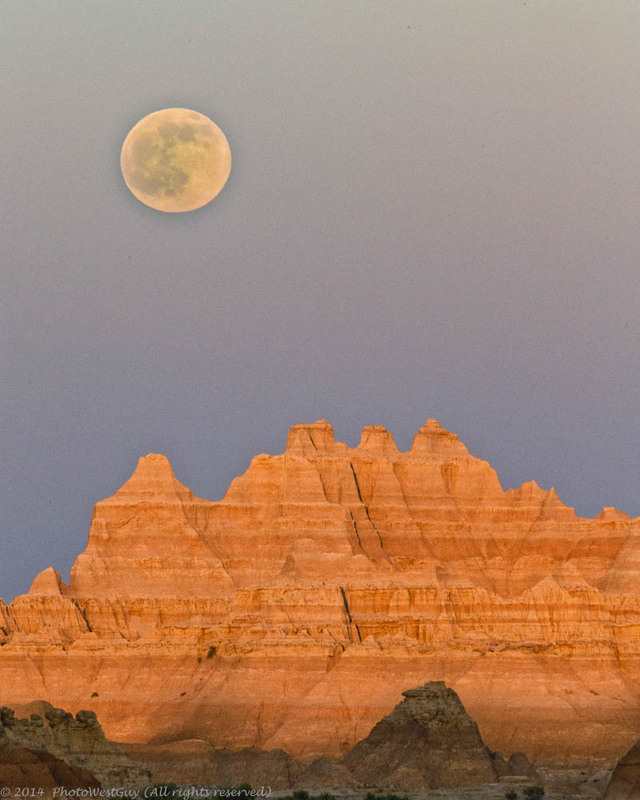 South Dakota Badlands – Rise of the full moon at the Doors and Windows View point. The red in the rocks are from the setting sun behind me. This is a view looking southwest across the Stronghold Unit from Sheep Mountain Table. If you ever have a chance to visit either landscapes, the rewards are plentiful. My only suggestion would be to slow down and enjoy the view. Take at least two or three days to explore each location and plan on getting up to see the sunrise. Oh, and don’t forget the sunset as well. Your best pictures will be at the ends of the day. When you have been photographing flowers for a while, you will often find yourself looking for some alternative ways to express your creativity. You can take a look at the works of Kathleen Clemons (http://kathleenclemonsphotography.com/#/special/splash/), Harold Davis (http://www.digitalfieldguide.com/galleries), Denise Ippolito (http://deniseippolito.com/fineart/) and a host of other sites that provide excellent examples of the kinds of photographic variations that you can try in your own photography. Instead of being content with simply shooting an image of the whole flower or flowers, why not just shoot parts of it. For example, images of the interior bits, the stamen and pistils, individual petals, or the part where the calyx joins the petals. 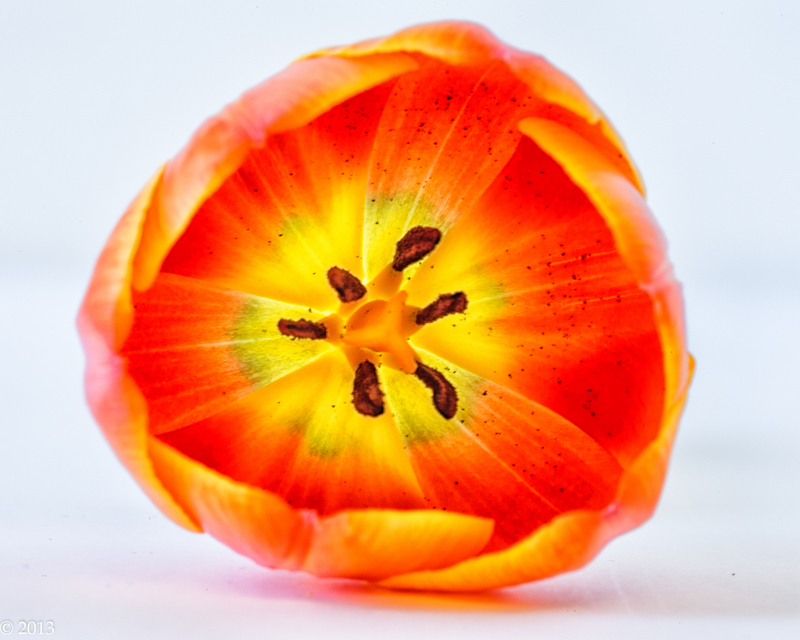 This is a shot of the inside of a tulip using a macro lens. 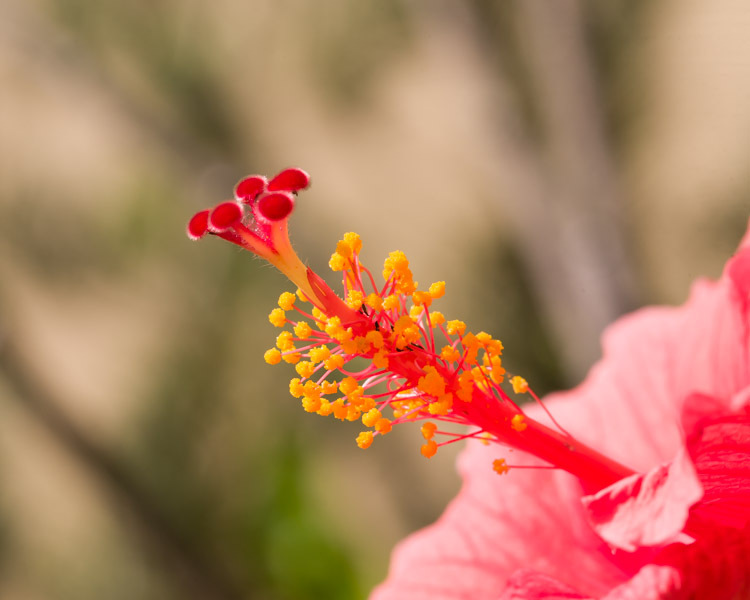 Details of the stamen and pistil of an hibiscus. There are a number of alternatives to this approach that use simple soft-focus approaches. One of the simplest is the use of Lensbaby® lenses and accessories (http://lensbaby.com/products) that are deliberately designed to produce this effect. These can also be duplicated using software such as Photoshop (http://www.photoshopessentials.com/photo-effects/soft-focus-lens/) or Nik Software Color Efex Pro 4. These types of images are often referred to as soft images or glow effect images and are applied to a wide variety of digital imagery other than flowers. 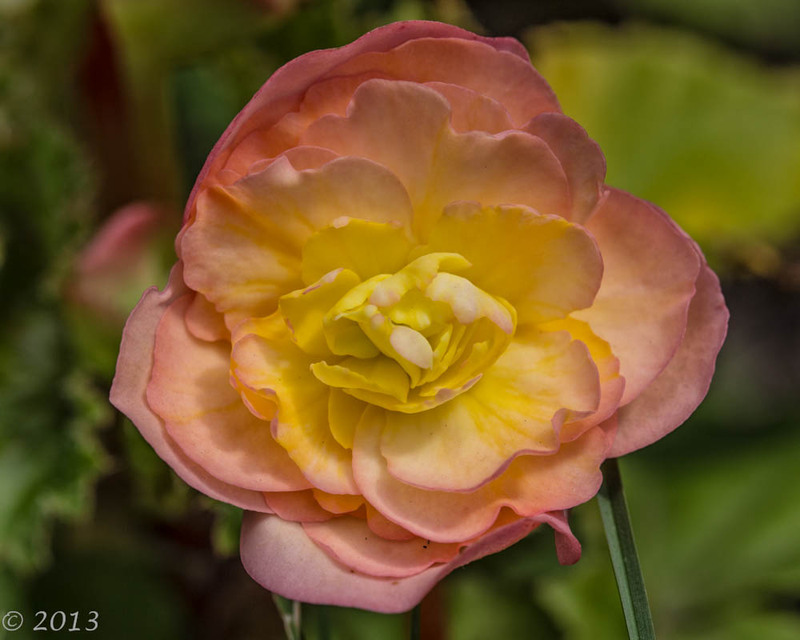 Denise Ippolito has described a variety of approaches to this aspect of flower photography in her e-book The Softer side of Macro. As well, various aspects of different approaches to focus and sharpness are covered in Harold Davis’ book Photographing Flowers. 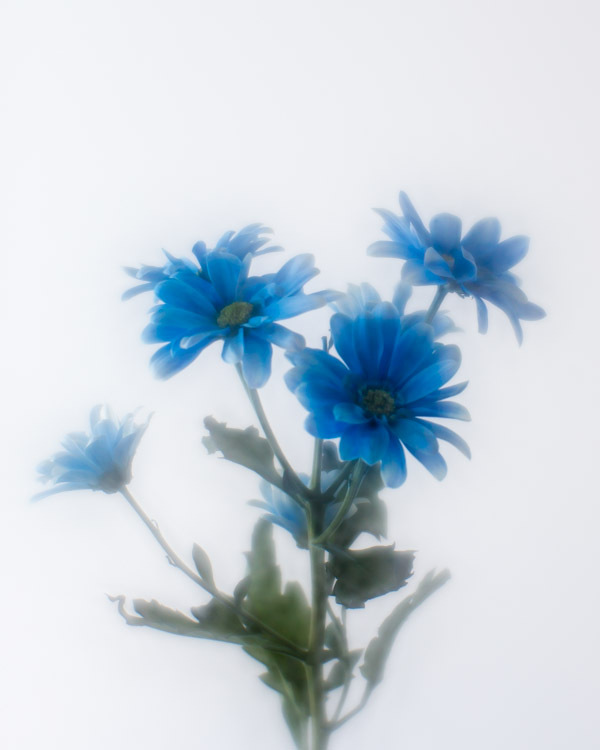 This image was softened using a Lensbaby accessory. High Key and Low key imagery are two techniques that are intended to produce very opposite effects. High key imagery is light and bright and aims at having no shadows. Low key imagery, on the other hand is full of darkness and shadows. 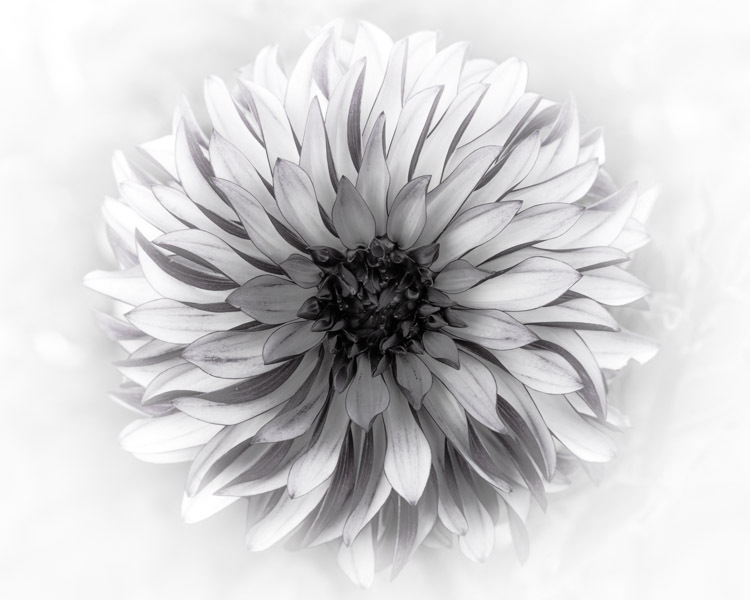 High key imagery is characterized by soft, pale colour tones. These images are bright, have very low contrast and few mid-tones or dark areas. The images should generally not be over-exposed and the details should not be blown out. These images are often shot in a studio using a white backdrop and a lot of light. Low key imagery is a style of photography that uses dark tones in an attempt to produce a dramatic image. Low key imagery tries to intensify the contrast in a picture by reducing the lighting on the subject. The intense shadows created are considered an integral part of the image. They effectively define the mood of the image. These images are shot in a studio using black backgrounds and very selective lighting. 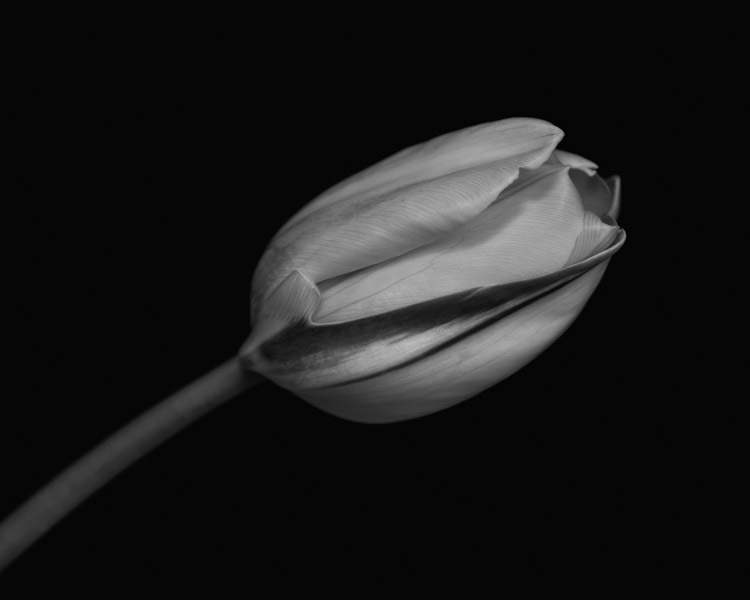 Low Key image of a tulip converted to black and white using Nik’s Silver Efex Pro 2. Both types of images can be created or enhanced in software using products such as Nik Software’s Color Efex Pro 4. 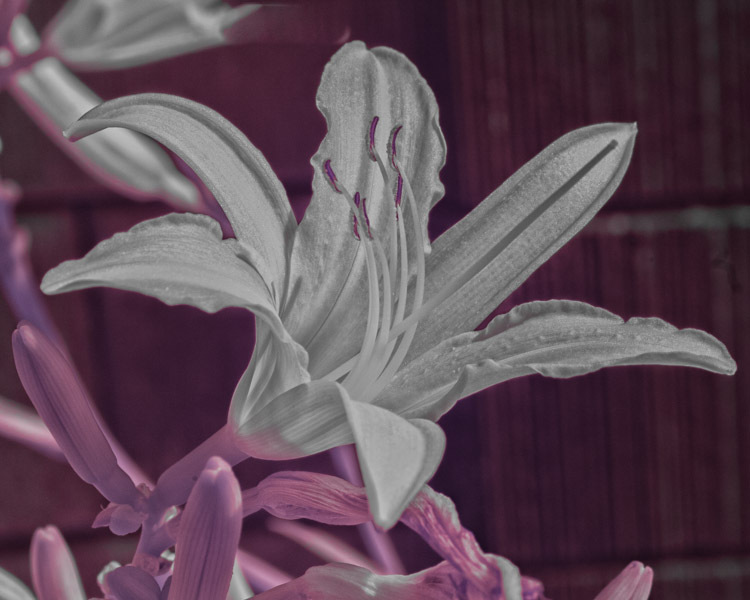 Although I have written a complete blog on the subject of infrared photography, it is useful to mention it again, because infrared imagery of flowers can produce some very interesting and artistic results. Tiger Lily shot in normal colour. Tiger Lily in IR with 590 nm filter – uncorrected. Tiger Lily image converted to black and white from the 590 nm image. Long before colour photography became the vogue, black and white imagery was the only form of presentation. Because this topic was the subject of two of my early blog writings, I will not go into a lot of detail here. All digital cameras today take pictures in colour. 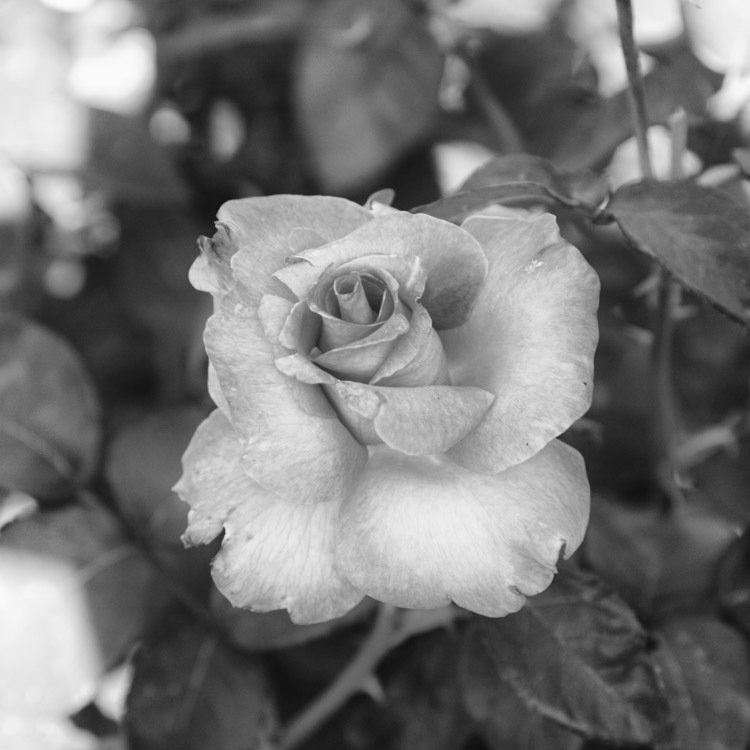 Some have the ability to render black and white images in the camera, but this is usually by converting the colour image to black and white internally. I would not recommend this approach to taking black and white images, as this limits you, to some extent, to the conversion made by the camera – a process determined by some camera designer’s idea of what a black and white image should look like. Rather, I recommend retaining the original colour image and then converting it in post-processing using one of the software packages available, such as Photoshop, Nik’s Silver Efex Pro 2 or onOne’s Perfect B&W. I regularly use Nik’s Silver Efex Pro 2 as the software of my choice. This does not mean it is any better than the others, it is just my choice a is have used Nik’s plugins for a while now and find that they do the job that I want done. Converting to black and white is a personal choice. How you do it, the software you choose to use and the effects that you like in your final result are all yours to determine. One thing to remember though: not all colour images are necessarily suitable for a black and white conversion. If colour is an important part of the image and its story, then black and white is probably not the best way to demonstrate this. Black and white imagery is more about contrast, texture, tones, form and shape. If this is the message that you want your image to convey, then maybe a black and white conversion is appropriate. Red rose converted to black and white using Nik’s Silver Efex Pro 2. Purple dahlia converted to black and white using Nik’s Silver Efex Pro 2. In the end, photographing flowers is all about you, the photographer and the message that you are trying to convey with your images. How you choose to shoot them; how you choose to process them and how you choose to share them is all up to you. It is your image and you are ultimately responsible for what is in the frame. If you are happy with the final result, then that is all that matters. the environment – you choose the setting for the photography. You can use a simple indoor studio as I have, use an outside window as a background, or any other setting within your home. As well, indoor setting such as greenhouses, botanical gardens or other similar facilities can be used should you have access to them. the lighting – you can decide to use indirect window light, room light, flash, or some combination of these. 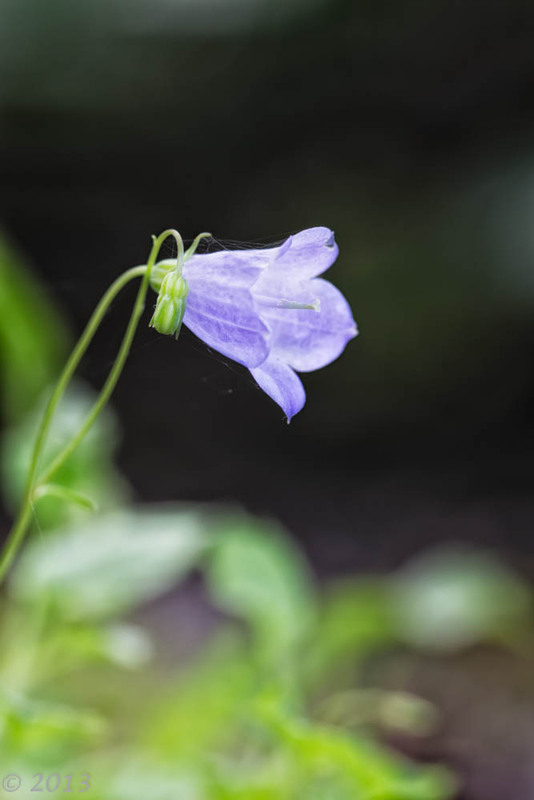 the subject – you can choose the flower or flowers that you wish to photograph. the background – you can determine what is in the image behind your flowers. With some exceptions, shooting indoors can give you complete control over your shooting environment. I will uses the term home studio to refer to any setup you may create inside. Greenhouses, botanical gardens and similar settings. These are not that different in some respects than shooting outdoors. The first thing you have to do is determine if you need any permission from the owners or curators, because, I would strongly advise you against just arriving at the door expecting to be able to set up your equipment and take pictures. 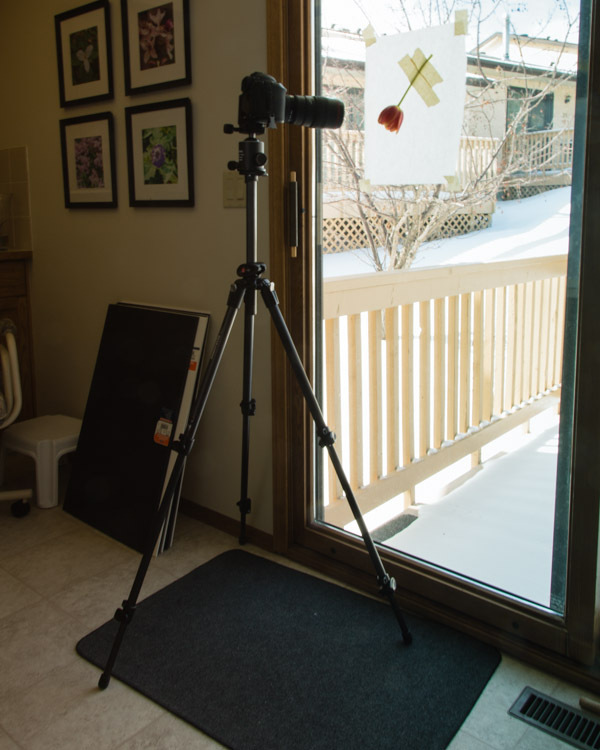 Some facilities may have very strict rules on what photographers can and cannot do in terms of setting up their equipment for flower photography. For example, tripods may not be permitted and the operators of the facility may also have rules about commercial photography versus non-commercial. So, check it out first. using an off-camera flash cord, allowing you to direct the light, will help prevent the usual harsh shadows that are produced by on-camera flash. Alternatively, you can handhold the flash and use remote triggers to activate it. using a soft-box that fits on your flash will also help to soften the light from the flash. setting the flash on Manual and reducing its strength will help subdue any shadows. If you are unable to use flash, then remember to compensate for whatever types of lighting are present in the facility. Also, you may not have a choice in what you can shoot, but take advantage of what subjects you can shoot and let your creative juices flow. Photographing flowers in your home studio is probably the best of all worlds when it comes to shooting flowers, particularly because you do not need any permission from anyone. The first thing you have to do is get a subject. Some types of subjects are available year round, e.g. roses, while others are only available on a seasonal basis, e.g. daffodils. For my subject of the week, I like to go to a local grocery store – yup, they also sell flowers – and review what’s available. I prefer to buy an assorted bouquet, that way I am not stuck with the same type of flower for a whole week. I say a whole week, because often the flowers come into the store every Monday morning and are kept in a refrigerator when not on display. Stores such as Costco, Safeway, Walmart, etc. all sell pre-packaged bouquets of assorted flowers. I am a bit fussy about the bouquets that I buy. I usually try and stay under $20 and I also try to buy one that has an assortment of flowers where I know I will use more than one or two of them in my photography. For me, there is very little value in buying an expensive bunch of flowers if I only end up using one or two of them for imagery. I will, however, buy small bouquets of a single type of flower, e.g. tulips or daffodils, when they are in season. Having only a few of one type of flower forces me to think outside the box when it comes to making images of these flowers. You can, of course, use cut flowers from your own garden, should you choose not to photograph them outdoors. My home studio is setup next to a large patio door so that I have indirect sunlight during the day. I augment light with flash in most situations. That way I can control both the light and the shadows. When using more than one flash, I use remote triggers to activate them. With only one flash, then I will use either an off-camera cable or a remote trigger, depending on how many hands I have free to hold flash units. When I am using remote triggers, I position the flashes on a second, smaller, lighter tripod that I have. When I shoot flowers in my home studio, I determine the background that I want to use. It can be white, black, green, beige, or some other colour. I will often use patterned cloth that I pick up as cheap remnants at a local sewing store. I encourage you to use your own imagination as far as backgrounds are concerned – the sky is the limit as the saying goes. 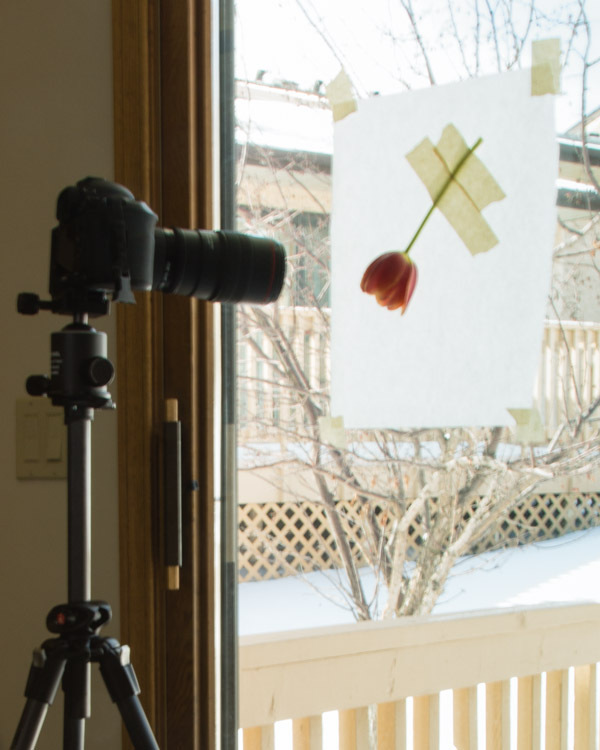 The other approach that you can use in your home studio, is to shoot flowers against a backlight such as a light box, or tape a piece of translucent paper against an outside window, tape a flower on the paper and use this as a setup for shooting. I find that parchment paper works very well as a translucent background against an outside window. Window setup with camera and subject. 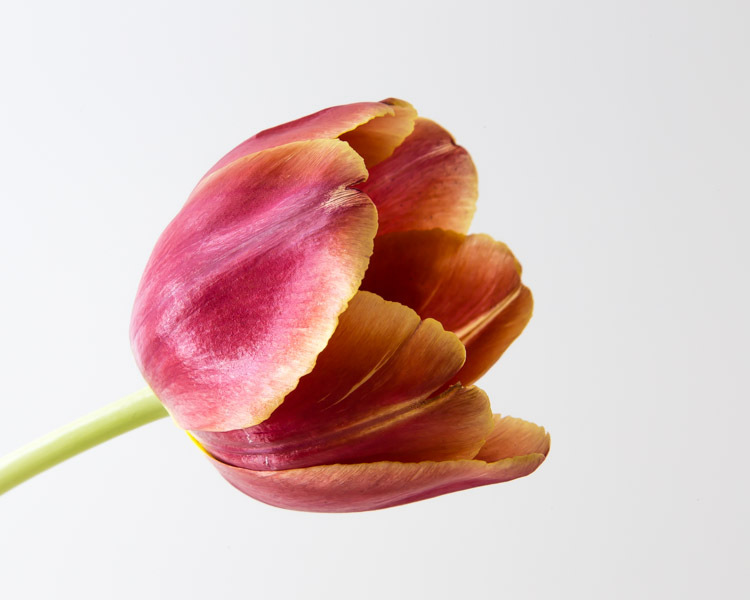 In this situation, I have used parchment paper as the background and inverted the flower for easier handling. I rotate the image after it is imported into Lightroom. Close up of outside window set up. 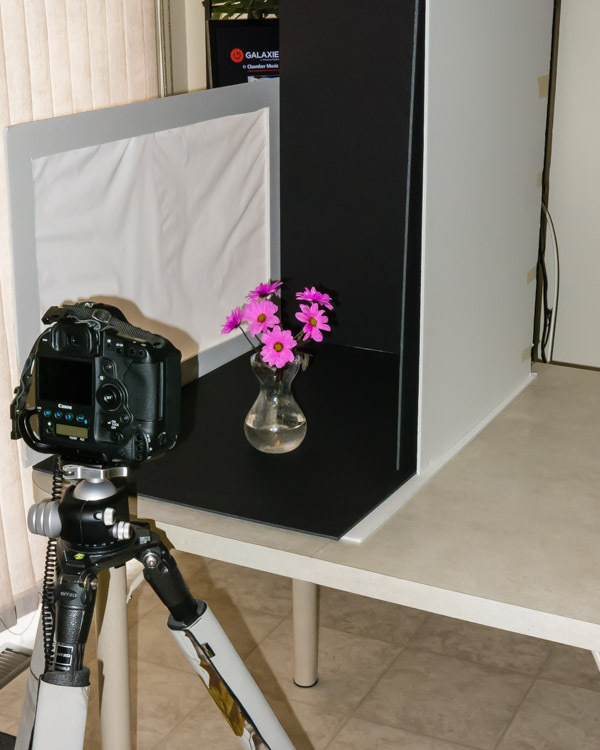 In a home studio, you have a wide range of choices, from the ambient light of an outside window to the artificial light produced by your home lighting to flash, or some combination of these. You can couple these sources with any combination of diffusers and reflectors. Diffusers do just what the name implies, they diffuse any light source and thus provide your subject with softer lighting than the bare source itself. You can use large hand-held diffusers for any of your light sources. If you are using flash as a light source, then you can use one of the variety of small softboxes that fit over the flash head. Reflectors can be used to direct light onto a subject or the background. They are often available in white, silver and gold. The gold reflector is often used to warm up an otherwise cold subject. Cold here means the colour temperature of the subject and not the temperature of the actual physical environment. The subject of lighting could fill an entire blog, or a book as it has done in some cases, but, I think you get the general idea from this brief explanation. The reality is that in your home studio, how you light you subject is entirely your choice. The subject is obvious – flowers. Something you want to think about are the props that you might want to use – yes, props! Do you want to use a special vase as part of the subject matter? Do you want the flowers lying down on something. For example, I bought a jar of black pebbles, all the same size at my local Michael’s store and have experimented with using these as a background for my subject. Don’t forget, your background is just as much a part of your final image as your main subject is. One thing I have done is to use patterned cloth as a back ground. I will buy remnants from a local sewing store and use these. The other type of background that you may wish to think about is one that you can insert using a suitable software program. Photoshop and the Perfect Photo Suite of plugins give you this capability. 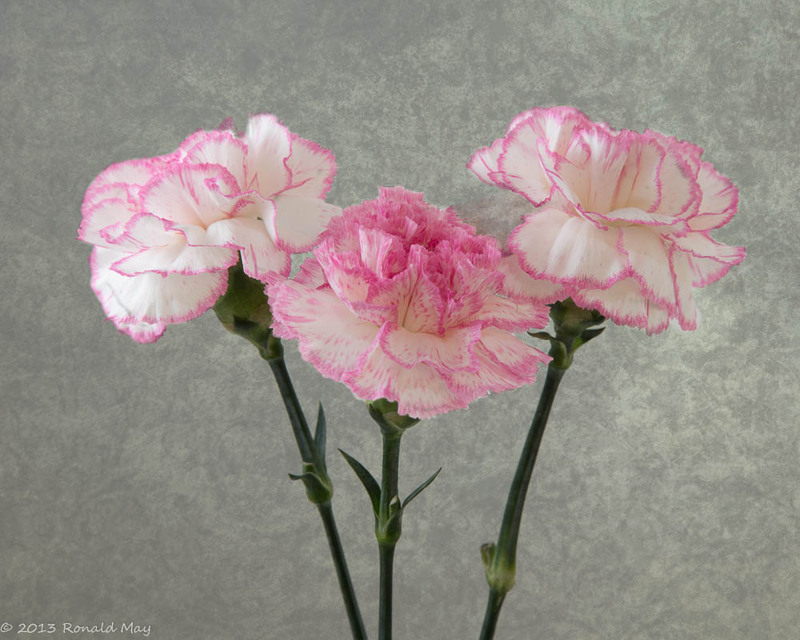 This image of three carnations had the background inserted during post-processing using the Layers plug-in in Perfect Photo Suite 8. I have already jumped the gun, so to speak, as I mentioned various types of backgrounds under the Subject heading. Nevertheless, there are other types of background you can use. For a simple, benign background, you can do as I have done, create a backdrop from simple foam core board. I use mostly white and black, but I have tried green and light brown as well. I prefer the white and black ones, but the choice is yours to make. Home Studio setup. In this situation, I have inserted black foam core board as the background. Note, however, that I am still using a home-made diffuser panel on the left. It is between the subject and the window light to help soften this light source. Regardless of how you choose to photograph your flowers, the results are all your responsibility. I would encourage you to experiment, let your imagination and your creativity run wild. One bit of advice: I have learned from bitter experience, not to delete anything in camera. Rather, I wait until I get the images onto the computer before making that final decision. The images that you see on the camera display are simple jpeg images, whereas, when you get the raw images onto the computer, there is no limit to what you can do to recover what you may have originally thought was a bad image. In the next blog, I will cover some of the more creative things that you can do in your flower photography – at least, I think they are creative. A lot of “flash lighting” is now being replaced by continuous source LED panels. This posting is a little late because I was, for most of the month of February, on safari in Africa, but I digress. Shooting flower outside, or outdoors should be a fairly easy situation. All you have to do is find them. There are only about two different places to find them – in the wild or not. Depending on where you live, you may have, as I do, a vast expanse of available out door locations during the growing season. In my case I have the prairies to the east and the foothills and mountains of the Rockies to the west. Most of the prairies are farmed and thus there are not too many places to find growing wildflowers. Your best bet is often a camp site or other park area that vary from those that are completely private to those run by one or more levels of government. In my case, while not always in the wild, I have access to local city parks, and both provincial and federally run parks. 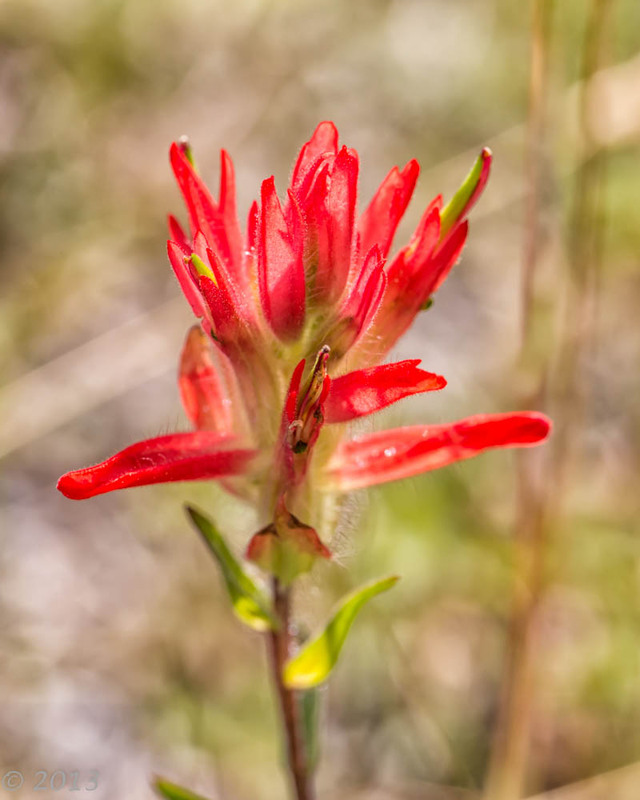 Indian Paintbrush in the wild. The viewer should note that this image would be much better without the out of focus element going diagonally behind the flower. The other main outdoor location is a garden. It can be your garden or that of friend. Personally, I don’t recommend photographing in gardens of strangers unless you get permission. This may be easy to do, particularly if you offer to give them printed copies of some of your better images. You also have to make very sure that you do not trample any of the vegetation in or around the garden. This also holds true for virtually any situation where you are photographing flowers. The old adage as noted in the introduction, take only pictures, leave only footprints…, is very true in any situation where you are photographing outdoors. 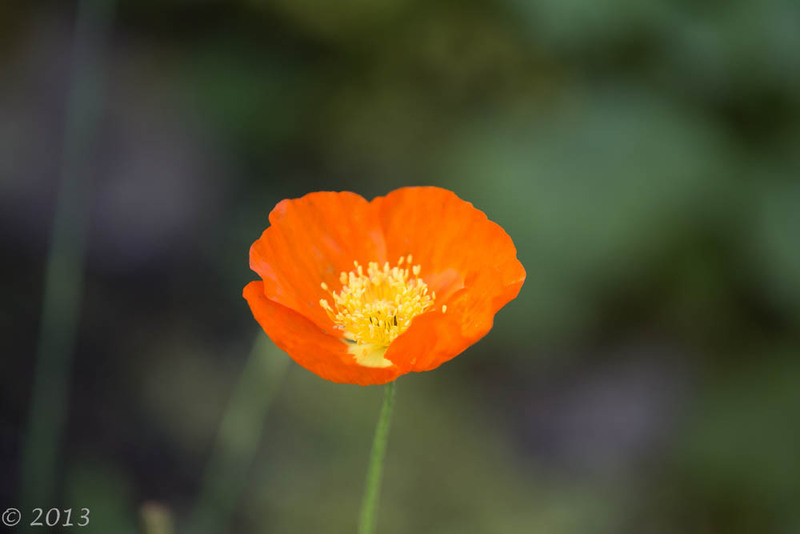 Flowers in parks or other public areas may or may not be truly wild flowers, but may be cultivated varieties as an addition to the indigenous wildflowers. Most of the public gardens that I have access to contain only cultivated flowers. This means that the beds are maintained, mulched, water, etc. by employees of the garden facilities or by local volunteers. One of the local gardens that I can use is maintained by volunteers and has specialty gardens where they grow different varieties of roses and one where they grow only sunflowers. Regardless of where you find flowers outdoors, the approach to photographing them is very much the same. You will need a camera, of course, a tripod and a lens of some sort, unless you are using a point and shoot where the lens is already determined for you. Nevertheless, you may be able to do some close-ups shots or some creative zooming with your point and shoot. If you have a DSLR with the ability to change lenses, then I suggest you experiment as different situations may call for different lenses. I use my 100mm macro for close-ups and couple it with extension tubes for extreme close-ups. I also use my 24-105mm and my 70-200mm for different situations where the ability to zoom in provides some creative advantage. What you use in your photography is up to you and the choices you have available to you. 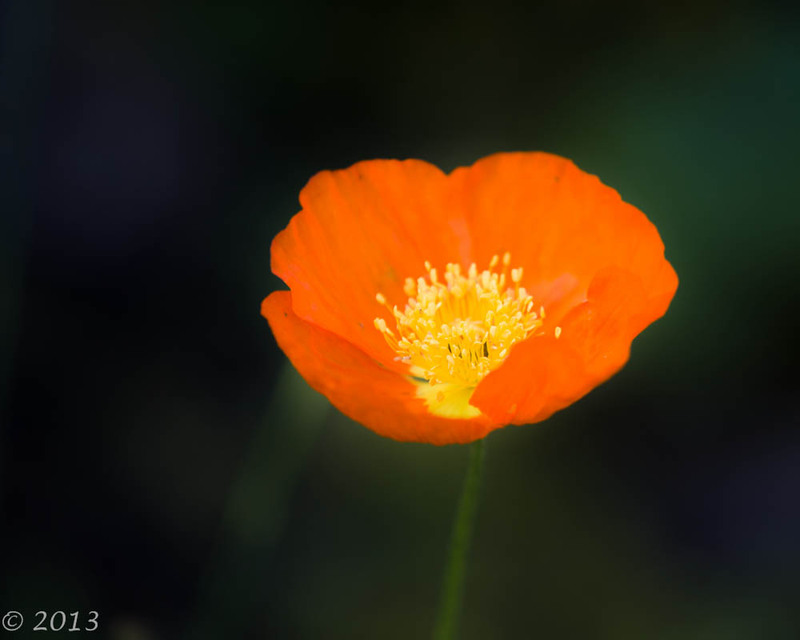 One of the main considerations in photographing flowers in the wild is the background. As a photographer, you are responsible for everything in the frame. There is nothing more frustrating, in my experience, than to take what you think is a great image, only to get it on the computer and find that there is some major distracting element in the background. If you are lucky, you may be able to crop it out without destroying the overall composition, but if you can’t do that, then the image may be destined for the reject pile. An example of a slightly distracting background. The out of focus shoots of grass and the blue flowers provide a bit of a distraction for the viewer. By moving in a bit closer and changing to a smaller aperture, I was able to eliminate the distractions. Other equipment that may come in handy are reflectors and diffusers, and a remote shutter release. 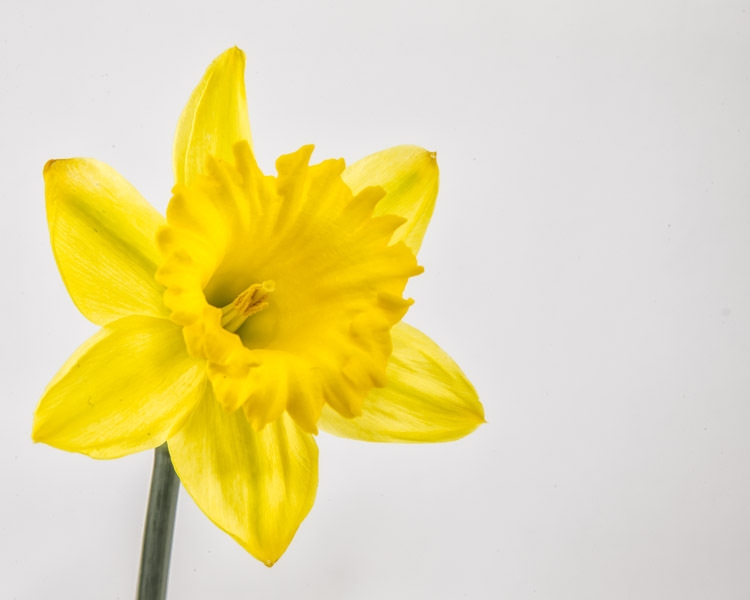 Reflectors can be used to reflect sunlight onto the flower to add light to the image. 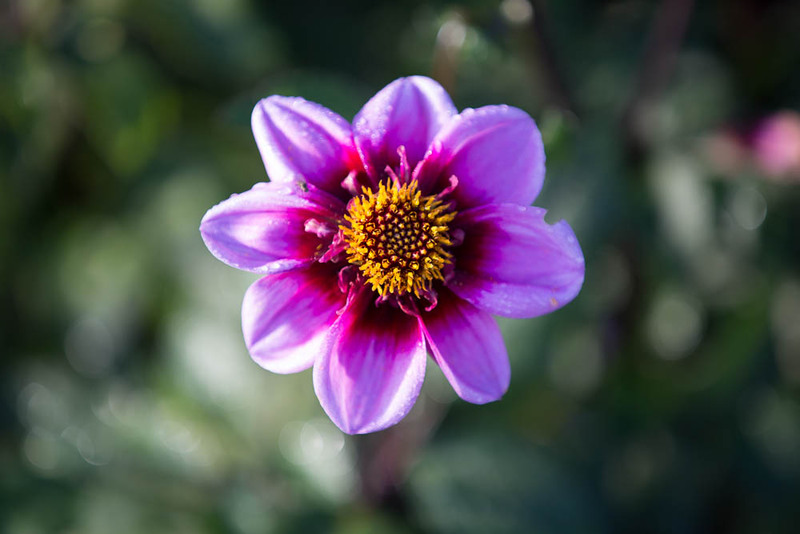 Diffusers may be used to block some light or at least diffuse harsh sunlight on a flower. A remote shutter release is necessary if you are going to be taking images that require more than an acceptable exposure time. You can figure out whether you need to use a remote release from the following guideline for handheld images: the minimum shutter speed for handheld photography is 1/focal length of the lens. You should adjust the focal length of the lens for the sensor size. For example, if you are shooting with a 100mm lens on a full frame camera, then the minimum shutter speed for hand holding the camera is 1/100 of a second. If you are shooting with a camera that has an APS-C size sensor, then the minimum shutter speed for hand held imagery is 1/(100 x 1.6) or 1/160 of a second. The number 1.6 is the multiplier you need for a C-size sensor. I would also suggest that you use mirror lockup and a tripod when using a remote release. If you are using a point and shoot camera, then you may have to experiment to find the slowest shutter speed you can use for hand-holding your camera. My recommendation is to always use a tripod, a remote shutter release and mirror lockup when shooting flowers. Using a tripod forces you to examine the image you are trying to capture and thus you can check for any background , foreground or image edge clutter and eliminate it before you take the image. You can also ensure that your image is in focus when you are using a tripod, something you may not check adequately when hand-holding your camera. If you have Liveview on you camera, then you can use it to assess the image’s focus before you take the shot. The only thing to watch, is that Liveview can consume battery life, so be sure to have an extra battery with you should you use this feature on your camera a lot. Use a beanbag. These are simple cloth bags that you can fill with beans, unpopped popcorn kernels ( my favourite) or rice. It should be big enough to support your camera and the lens you are using. Simply place the beanbag on the ground, place the camera on it and fire away. Use your tripod. Some tripods come with a centre column that can be inverted, allowing you to take pictures with your camera upside down. Alternatively, you may be able to spread the legs of your tripod at a wide angle allowing you to get closer to the ground. Lie down on the ground. If you can shoot the image with your camera hand-held, then simply lying on the ground should be sufficient. You may want to have a piece of plastic or some type of ground sheet if you are going to do this, particularly if the ground is wet or muddy. Photographing flowers outdoors can be rewarding as the opportunities are only limited by your imagination. Besides, being outside in the sun and fresh air is always a bonus.